Last night was not great in terms of sleep …. 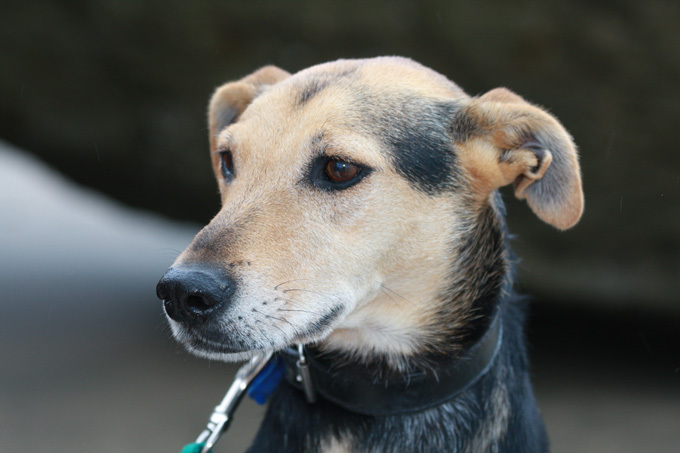 Graham counted 35 sandfly bites on one foot … itchy!! 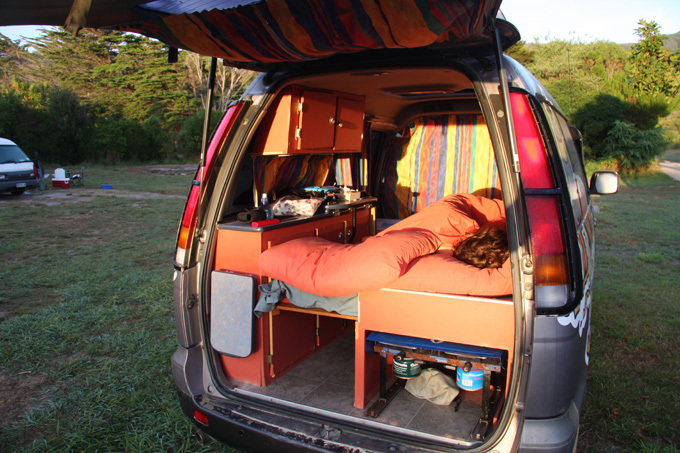 If one person cannot sleep, the moving around certainly keeps the other awake … it is a very small camper! 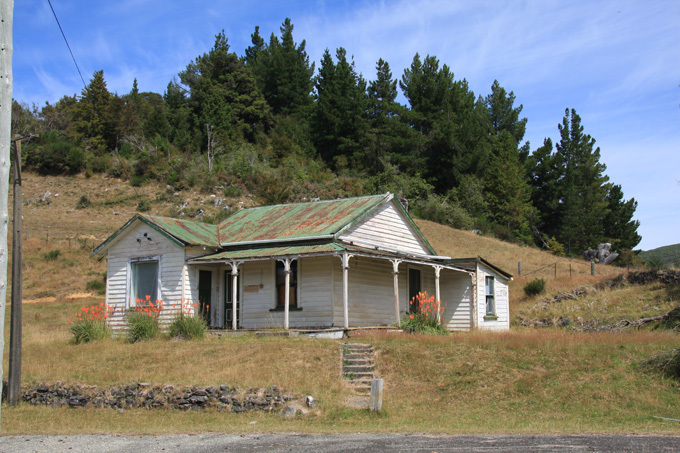 We continued on from Murchison via Springs Junction to Hamner Springs. This is a town that has an extended tourist season due to the skiing in the winter and the thermal baths and spas throughout the year. It is a lovely little town with a nice feel. The main street has a wide grassy area in the centre maybe 50 m wide with rows of old oak trees. Lots of picnic tables and shady parking. The pools themselves are great, with lots of pools of different temperatures and some really smelling strongly of sulphur. There are also separate pools for the kids with water slides. 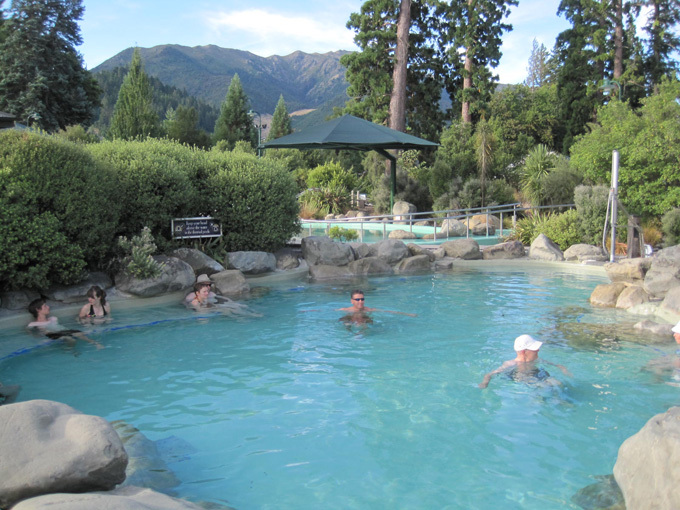 A great family destination, with lovely mountain scenery all around. After spending the late afternoon early evening in the pool we headed south out of the town to find a place to camp. 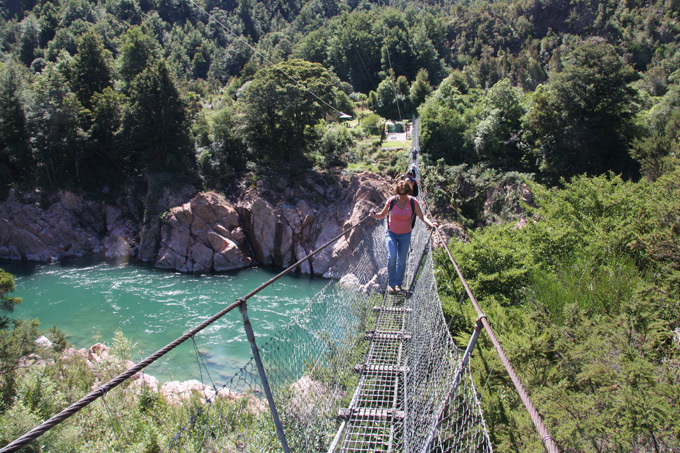 We found a bridge with river access about 25km south of Hamner on the Waiau River where we could camp right by the water, well off the main road. Graham spent the last 30 minutes of light fishing, but needless to say he caught nothing! 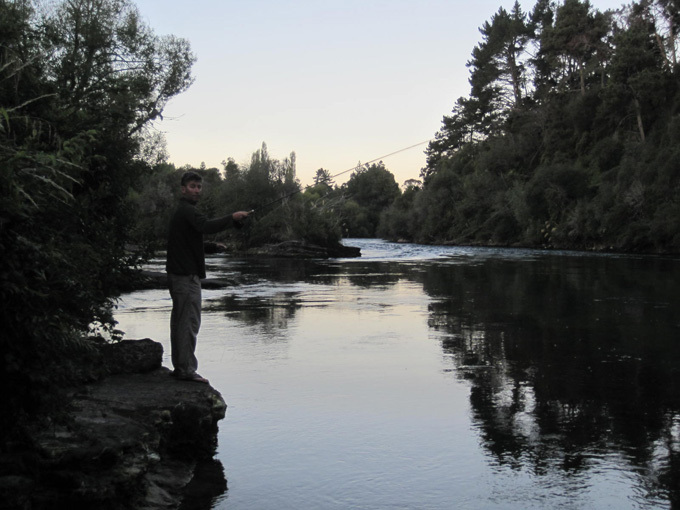 In the morning another fisherman came by and offered to take Graham out and fish the rivers at the top of the Nelson lakes next time he comes ….. he also pointed out some things should be done differently to catch fish in NZ …. handy but maybe a bit late for this trip ….. The scenery is really pretty on the road towards Christchurch and the weather still sunny and warm. As we dropped down onto the the east coast the temperatures dropped and the wind increased. Still nice, but jumper weather. 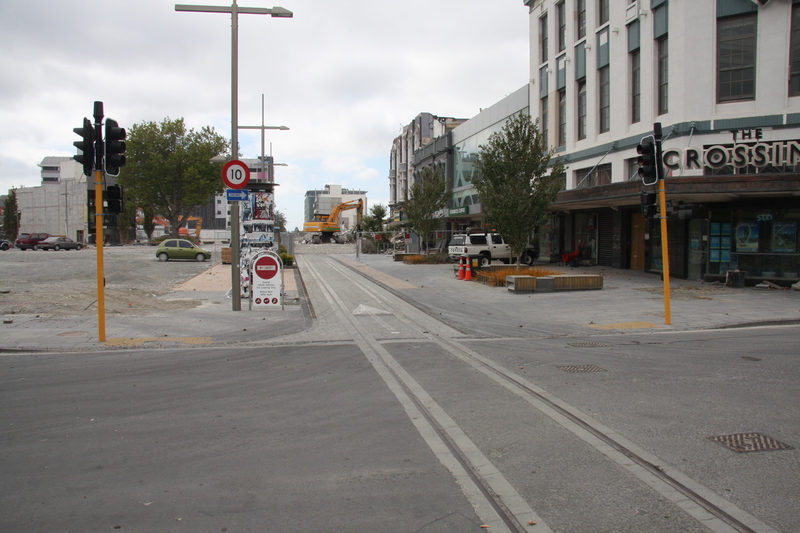 As we approached the centre of Christchurch we started to realise the scale of the damage to the city caused by the earthquakes in 2010 and 2011 . We could hardly recognise it from our last visit in 2009. It is really sad to see whole areas of the city closed off with Barriers. The Red zone. Big areas stand empty where the big buildings have been demolished. 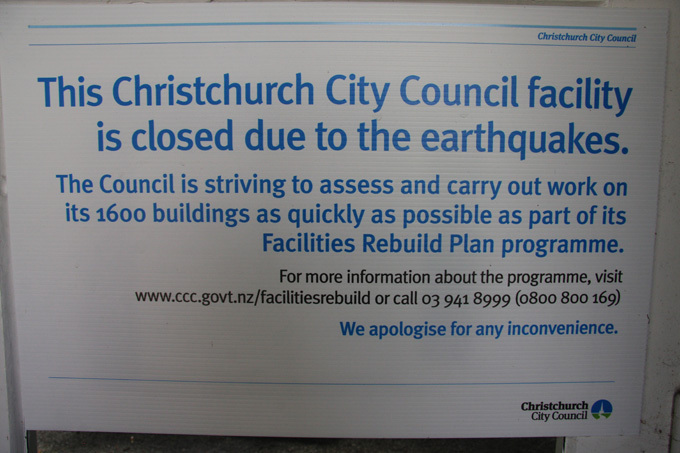 Most casualties were in the TV building that totally collapsed at around lunchtime on 22nd February 2011. It is almost exactly 2 years since the big earthquake and since then there have been literally thousands of tremors. 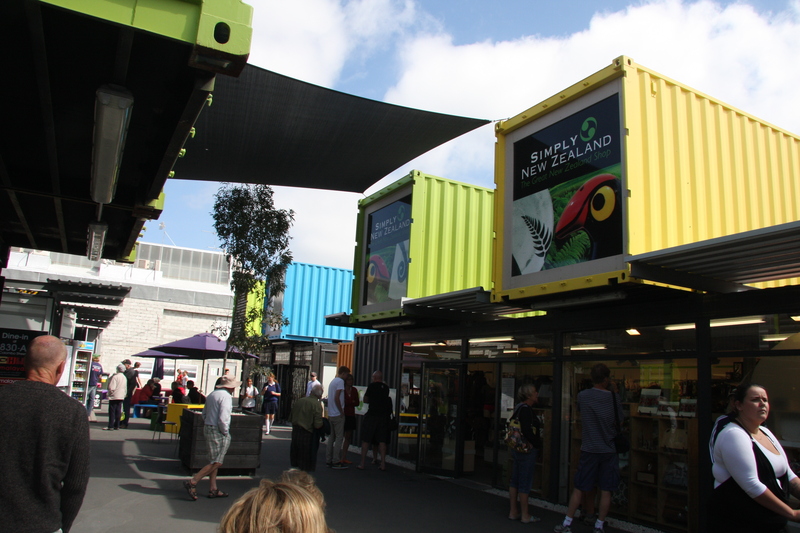 Some of the inner city shops have started to reopen housed in temporary buildings and containers. 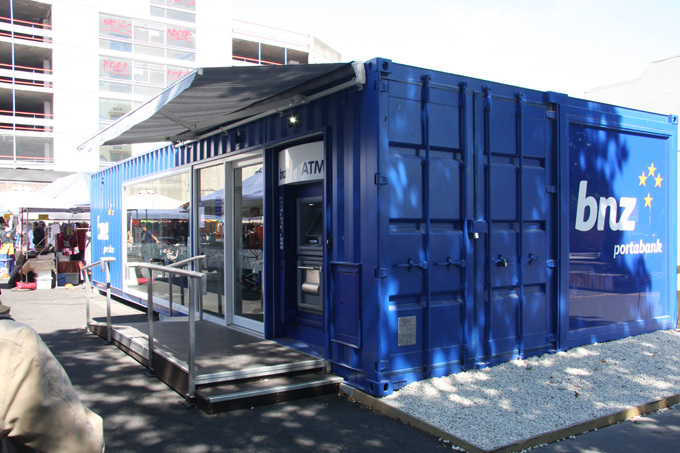 Even the banks are in converted containers. 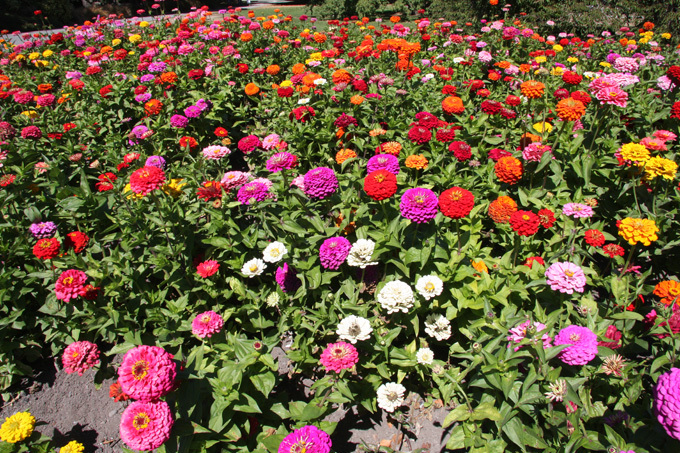 In the afternoon we also walked around the botanical gardens, which are intact except for some of the council owned buildings which have not been repaired or tested for structural integrity yet …. there is a massive backlog. 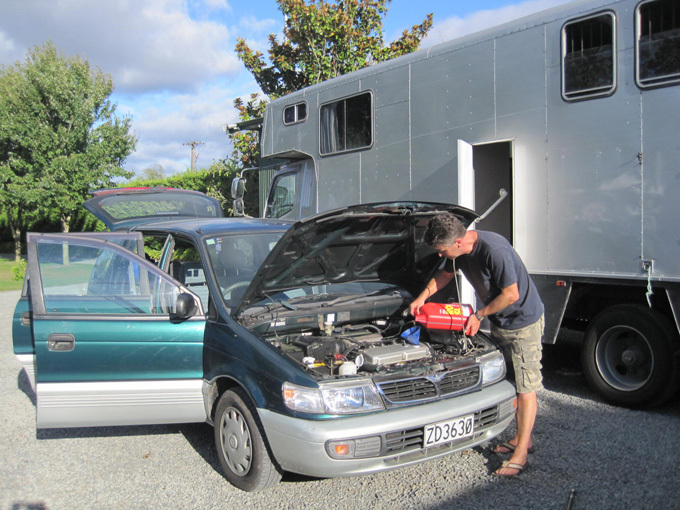 That night we stayed in an old motor camp, right next to the Christchurch raceway. 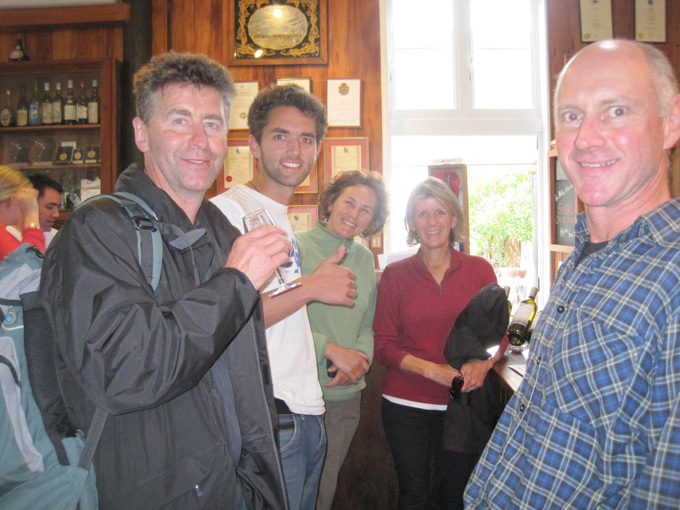 It is handy as a stopping off point to visit Will, the vicar who married us many years ago, and his wife Farrabee. 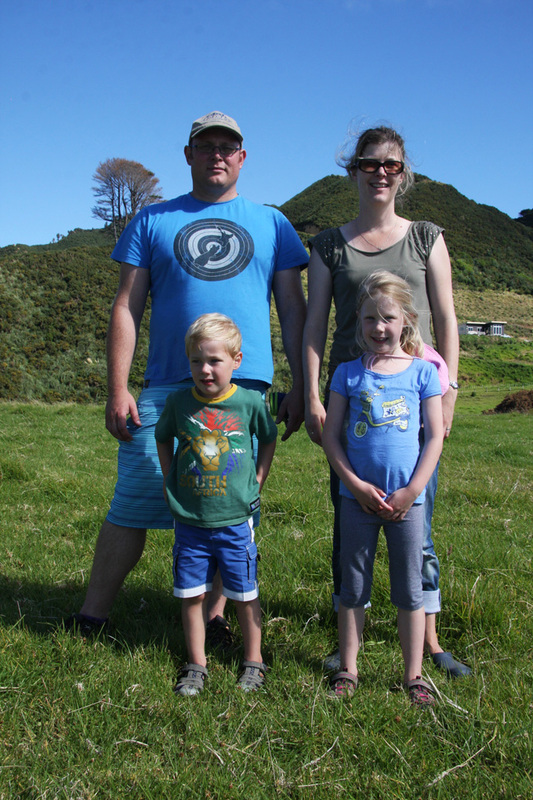 They are living in a motel while waiting for their house to be repaired after the quake. 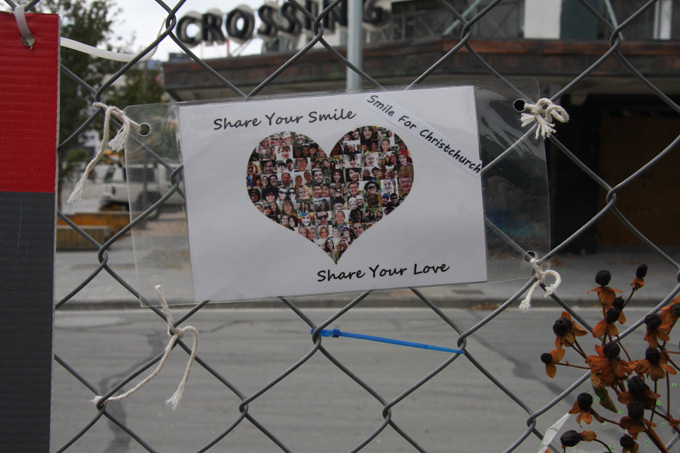 It has been so tough for people living in Christchurch. We met up with Will and Farrabee in their motel and headed off for lunch. It was lovely to see them both again as they are great fun and very kind. 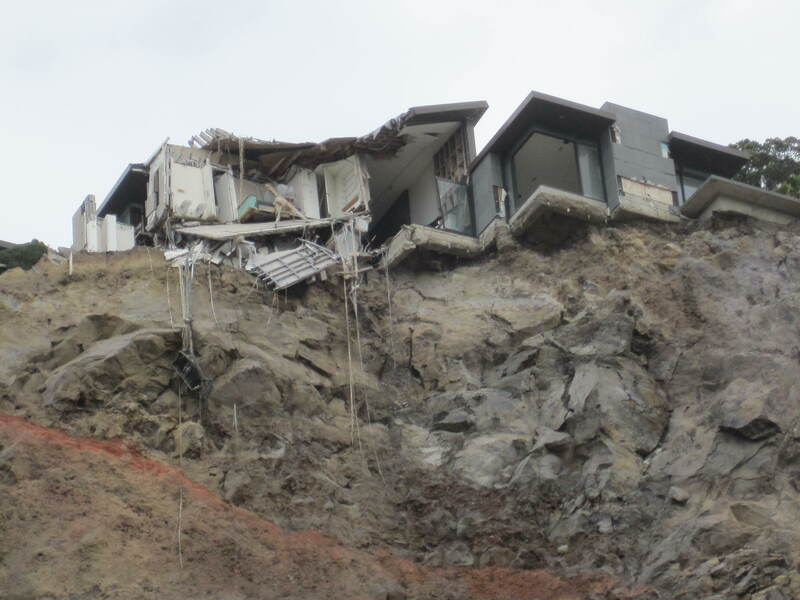 They took us to see some of the damage at a place called Sumner. Here there are lots of houses built on the hills overlooking the sea. 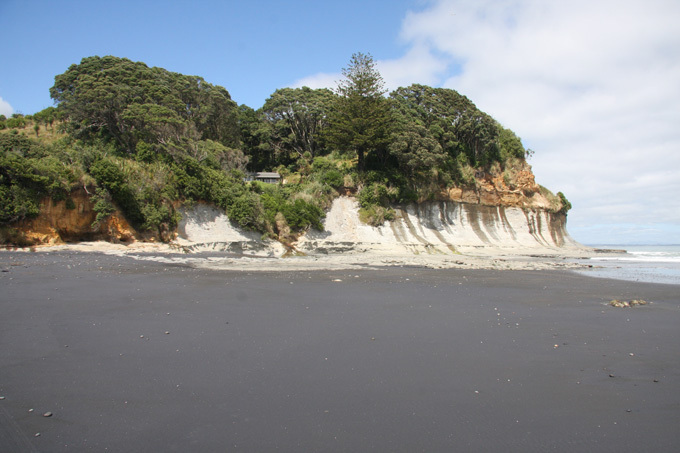 Some of these cliffs collapsed during the quakes leaving houses hanging on the edge. 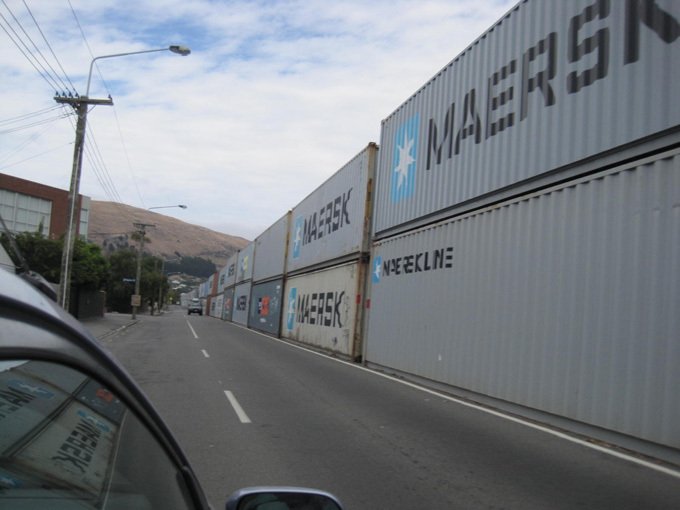 Again containers have been used to provide protection to the road and traffic. There are hundreds of them. 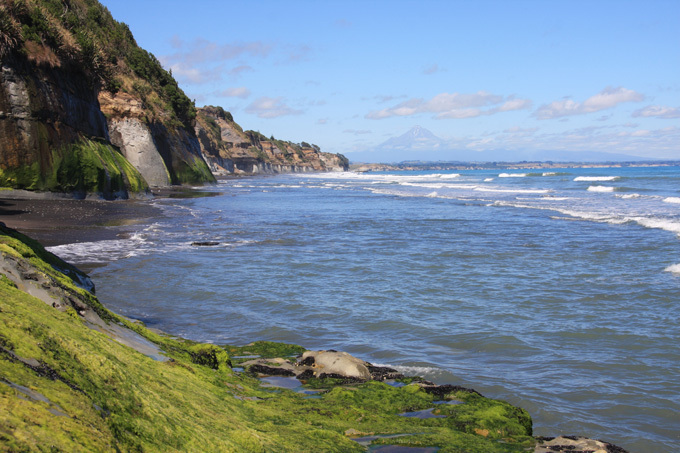 We then went down to watch the surfers and paddle boarders at Sumner beach. It looks to be a great surf beach, with long breaks. Thanks for a nice day Will and Farrabee it was great to see you both again! 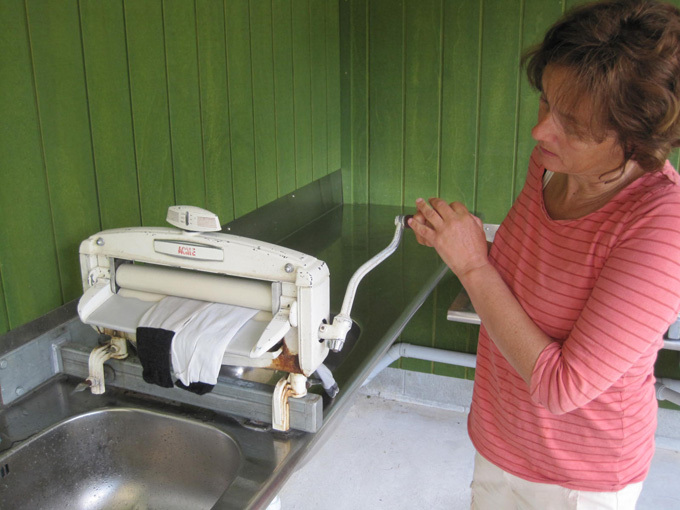 Just before leaving Abel Tasman Marjool decided that she should try out the mangle …. Amazing what some people do for fun! 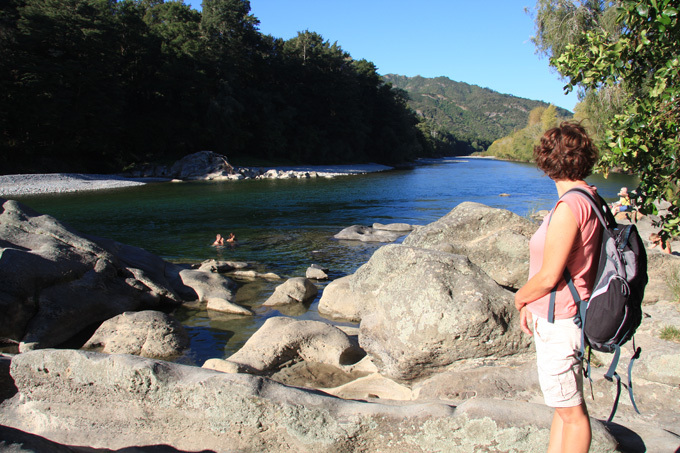 On the way back to Takaka we stopped at a little place called the Grove, which was a short walk through some unusual rock formations, leading to a huge split in the rock that you can walk through to an observation platform. Worth a small detour. 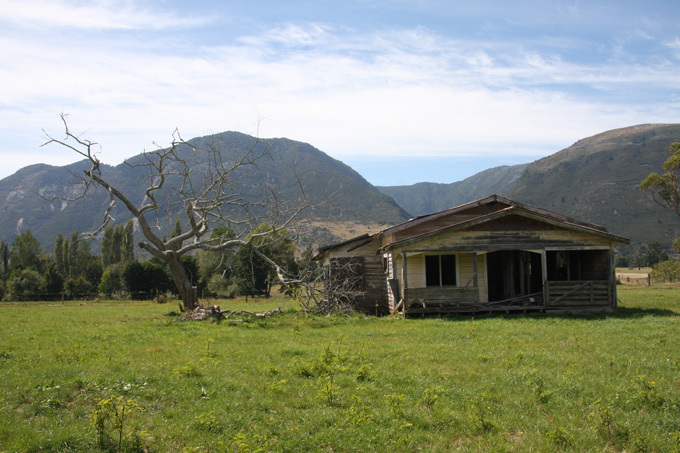 We then then turned onto the Motueka Valley Highway. The scenery is stunning and there is lots of nice places to fish. 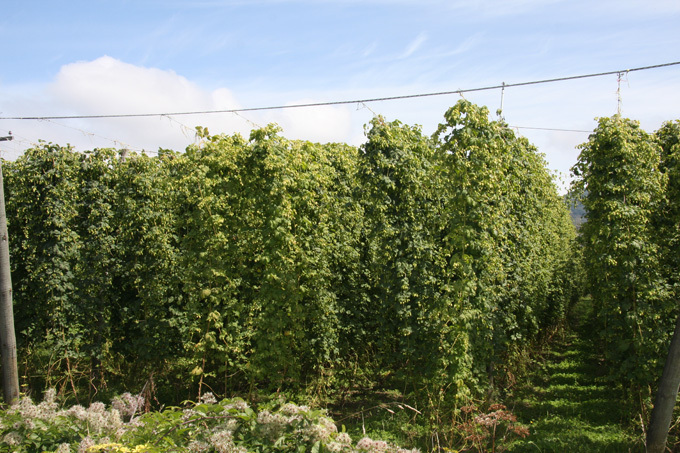 On the way through you can see Kiwis and Hops being grown. 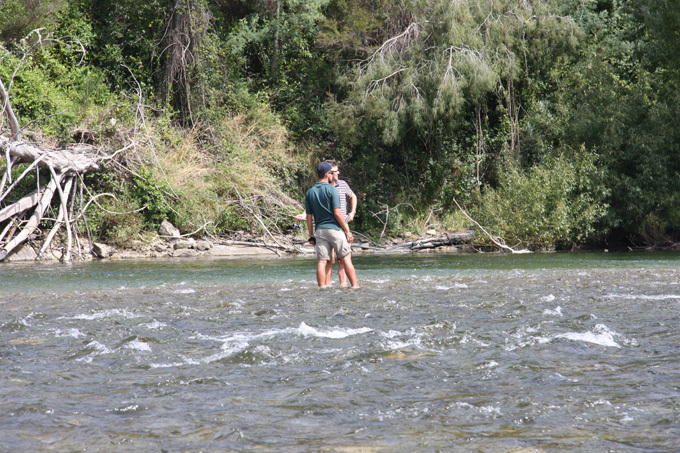 The fishing spots are great but you need waders or at least some way of stopping the sandflies eating you alive. As soon as you get down to the water they swarm on you. I had long trousers but bare feet, and once engrossed in the fishing, failed to notice the black swarm on my feet. 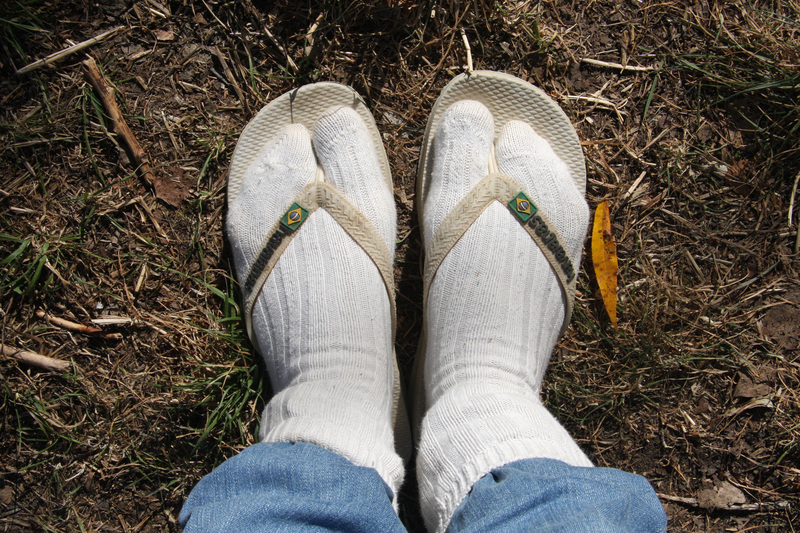 A day later it was so itchy that I could not sleep ….. very silly!! I could see the fish taking from the surface and dropped the flies on their noses, but whichever ones I tried, they ignored them and took the real thing instead! 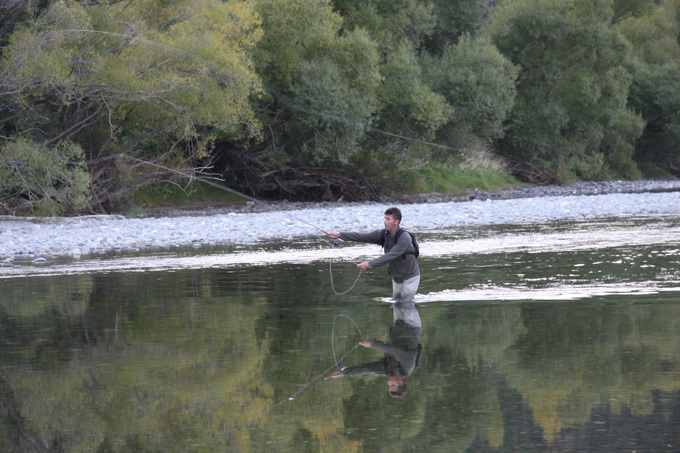 I then tried spinning and saw some huge fish follow the spinner in …. but never a take!! I think I am just no good at this!! Next time I will get a guide for a day or two …. 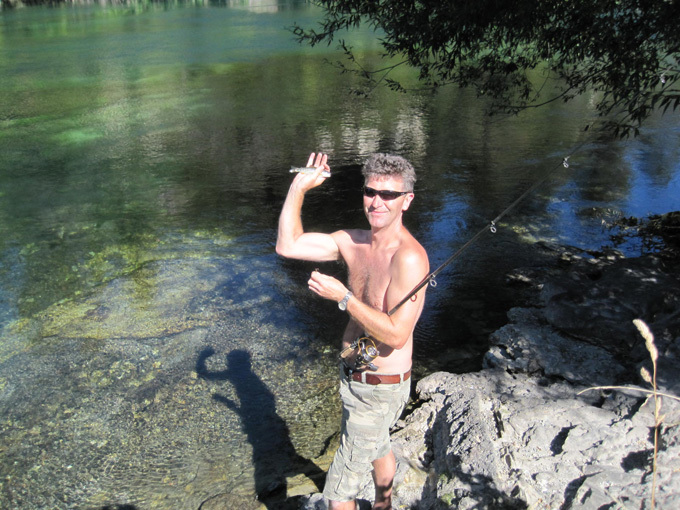 The problem of keeping travel companions occupied while fishing is also a challenge …. 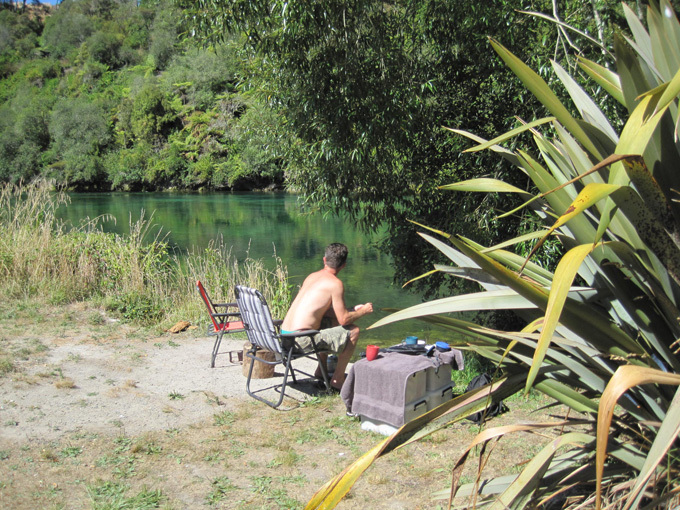 particularly with the sandflies … you can’t just sit on the bank with a book … you’d be eaten! Marjool set new trends in order to stop getting bitten. The second time I put my line in the water a ranger arrived to check my fishing licence. Don’t be tempted to fish without one. 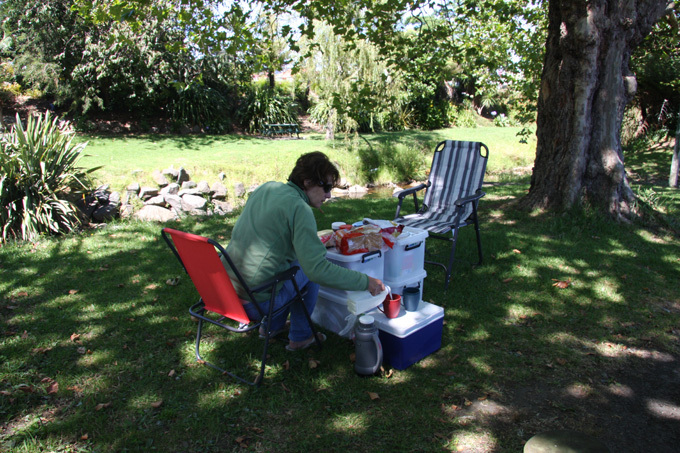 We camped along the Motueka River in one of the picnic areas where free camping was allowed. If you don’t mind washing in cold water there are lots of free places to camp. Continued along the river to Howard Junction and then turned onto Route 6 towards Murchison. Lots of old house on the way. 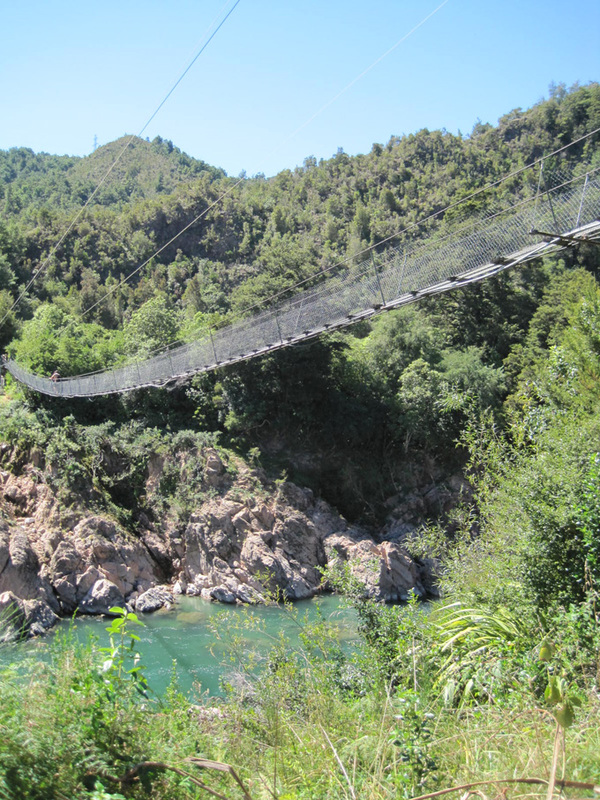 Just past Murchison there is a long swingbridge (New Zealands longest). 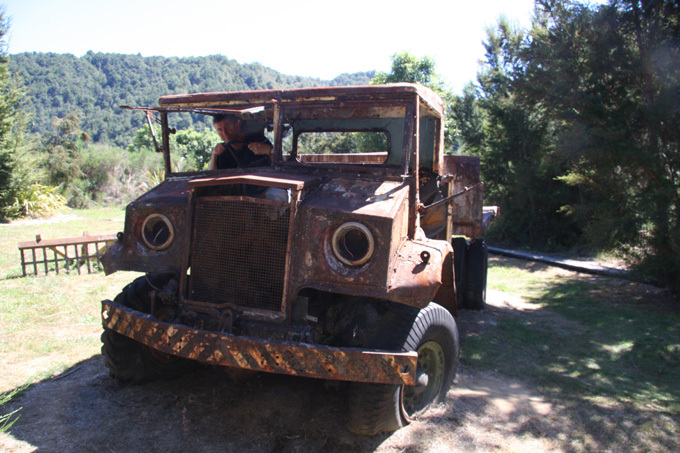 You walk along a fault line from the big quake that they had here in 1929 and there are some old rusty vehicles left from when some quarrying was done on the site. 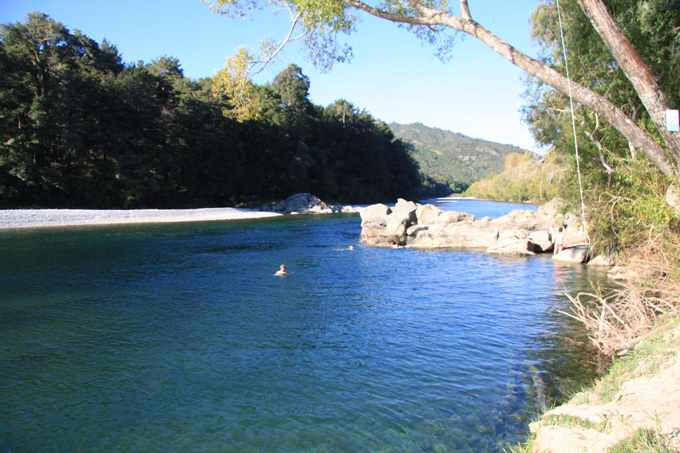 We camped back in Murchison in a campsite that had great swimming in the Buller river. 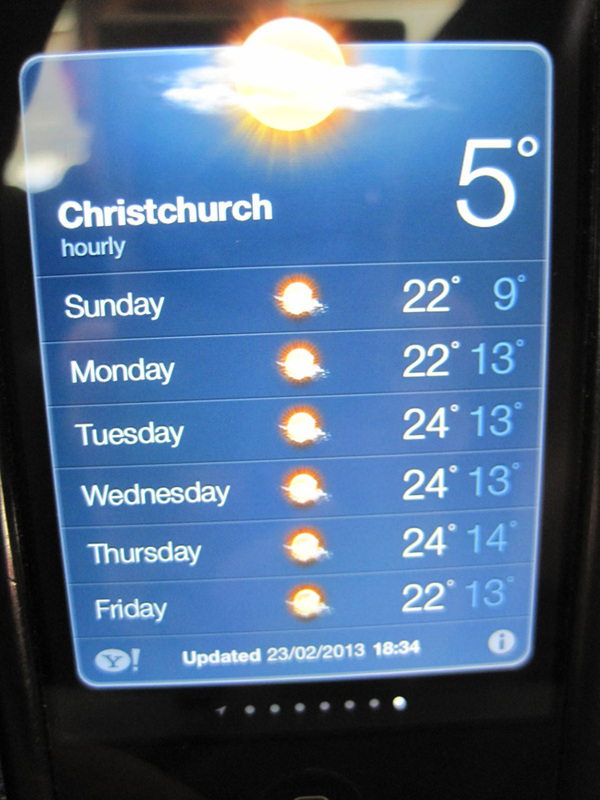 Now carry on towards Christchurch where the weather is still looking good! In the morning there was much rushing around with trailer loading, picnic preparation (thanks Clara and Marjool) before we could head down to the beach. 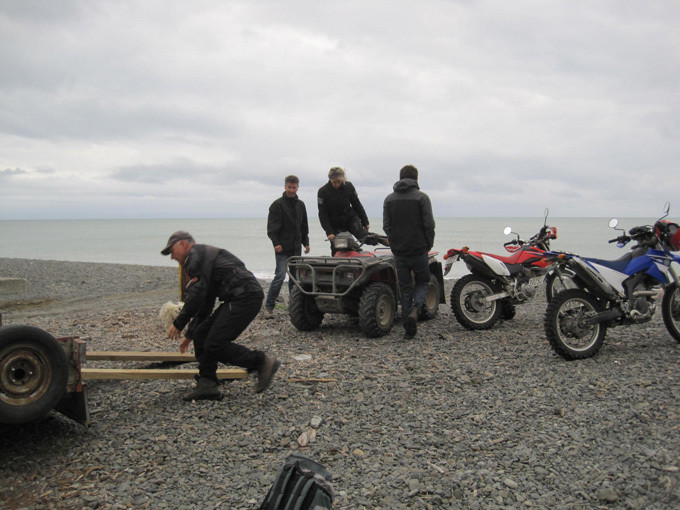 Once there we unloaded the quad and strapped the picnic to the front. A dog cushion was loaded for comfort (they didn’t mind as they were coming too!). 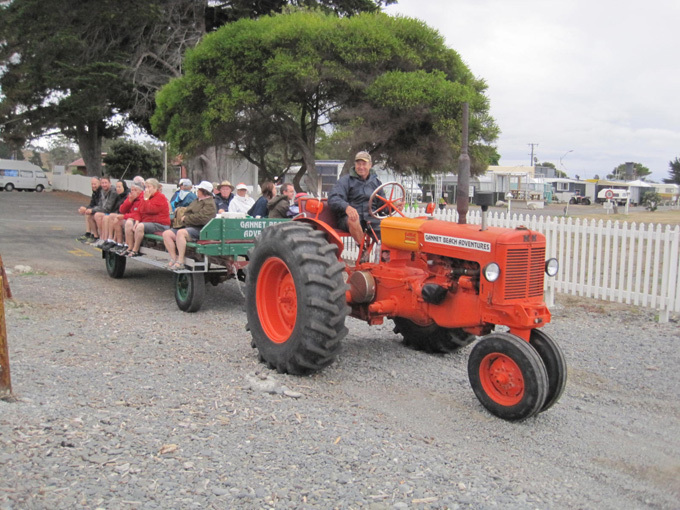 The normal way to see the gannets is on one of the operations that take visitors along the beach on trailers pulled by tractors. Once we were all loaded up …. 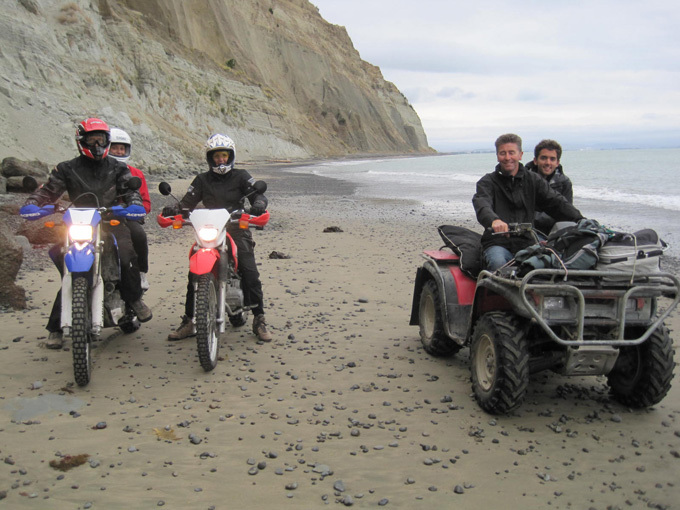 Graham, Marjool, Tom, Eddie and Jessie on the Quad, and Denise Steve and Clara on the bikes, we set off along the beach. 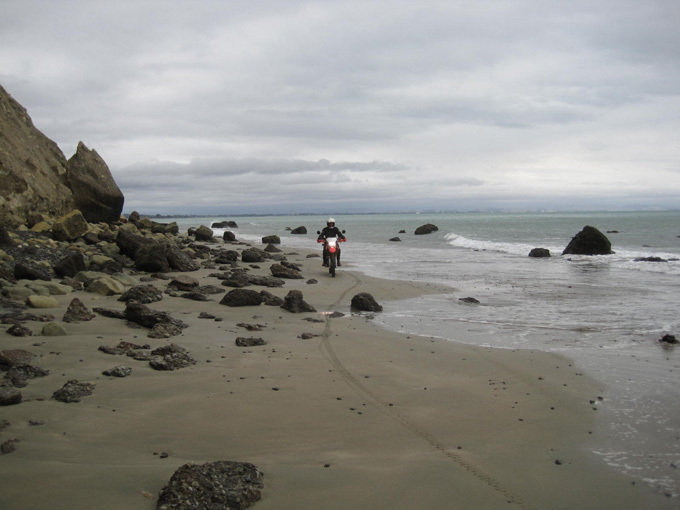 The beach was great for the bikes. 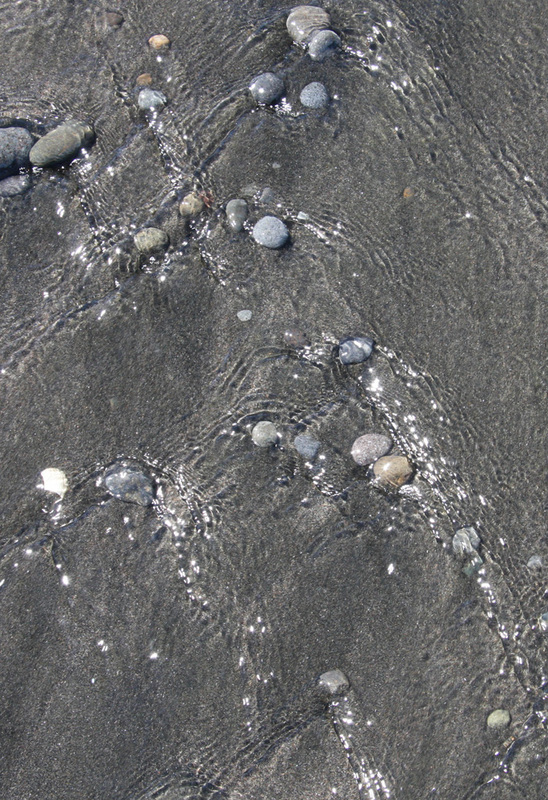 Often you had to wait for the waves to recede before you could drive around them. Great fun. 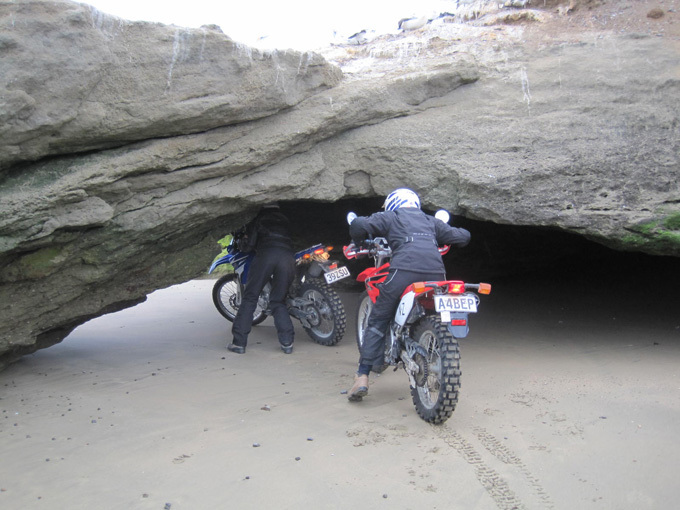 At one point we squeezed through a narrow hole in the rock. First the bikes and then the quad. Clara did a good job even though she is more at home on horses! 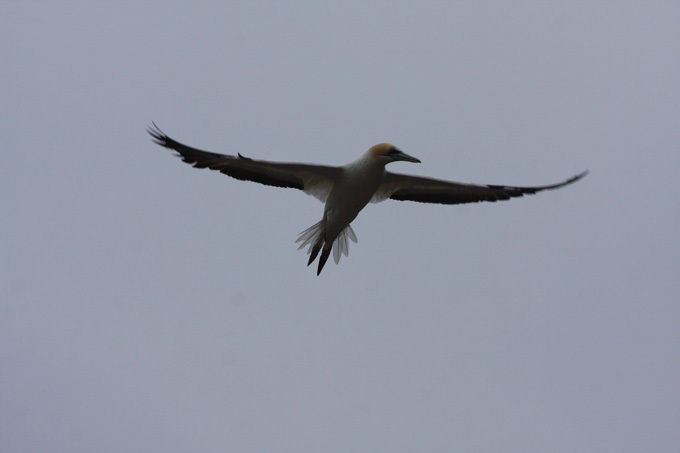 So we were all through and directly under a small colony of gannets. It’s hard to believe but the information board said that the wingspan can be up to 200 cm! Jess was interested in the birds, but sat calmly on the quad. Very well behaved! We then continued on to the main colony, parking the bikes and walking up over the hill. 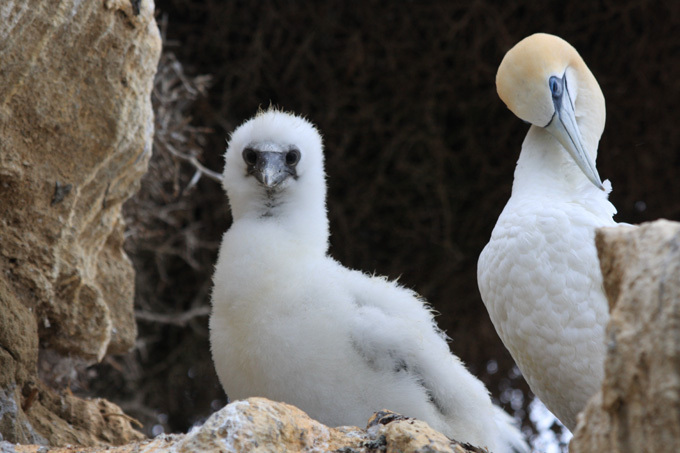 There are thousands of gannets there and the colony is steadily expanding. 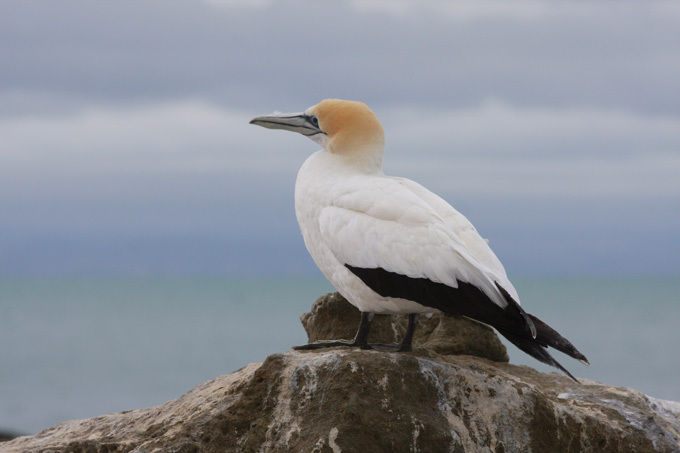 That is good news for the gannets and must mean that fish stocks are healthy. After driving back along the beach we went to the Clearview winery for tasting and snacks. Then it was home for a BBQ. 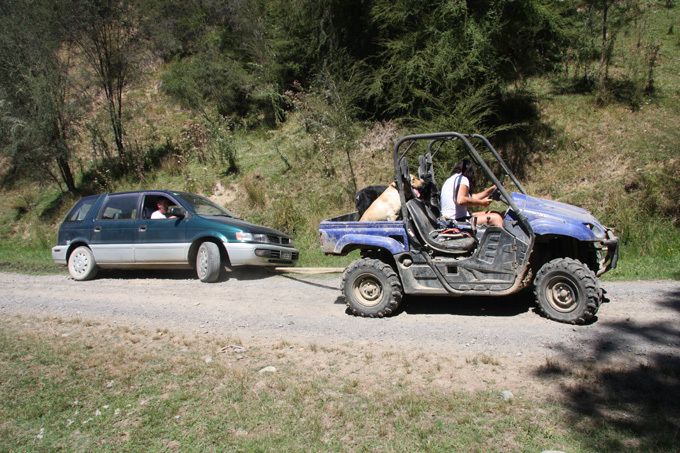 In between, we managed to change the oil in the Mitsubishi and go for a ride up to Mt Mata in Steve’s old ford pickup … 1929 I think. 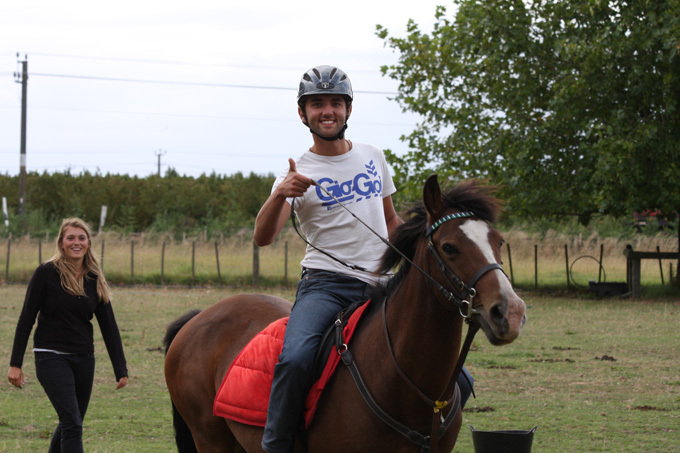 Tom was also keen have a go at riding a pony, it’s not every day you are offered a lesson from one of the Swiss national equestrian team! Amie, Steve and Denise’s daughter also represents New Zealand. The BBQ was great and topped off a brilliant and interesting day …. Thank you!! No early alarm tomorrow, though I am sure that with a tiny bit of encouragement Steve would have us up early again tomorrow for another adventure before we leave! 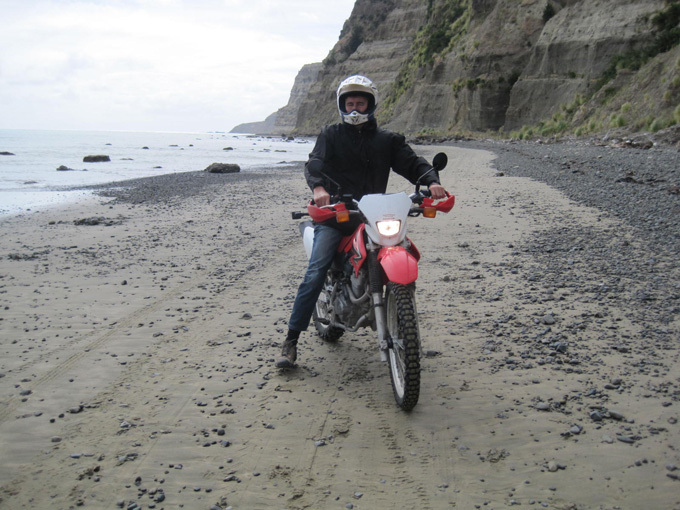 Camped in a small campsite in Stratford last night and then travelled along the Forgotten World highway to Taumaranui and then on to Tongariro National Park. It is a beautiful drive and would be really good fun on a motorbike. 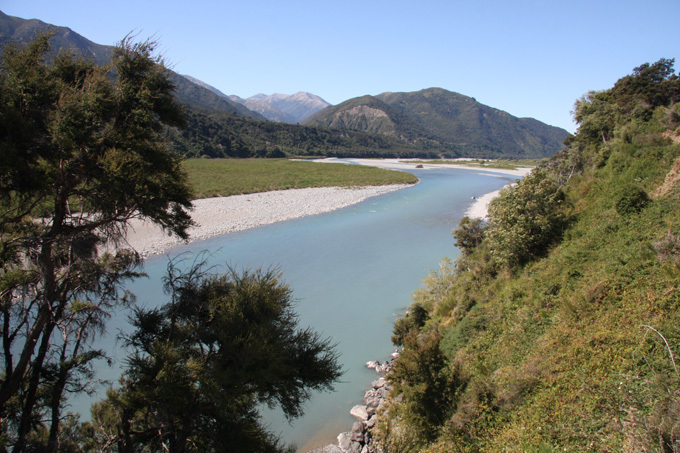 Just before Taumaranui you pass the Whanganui River, which looked a great place for a kayak trip … but no time! 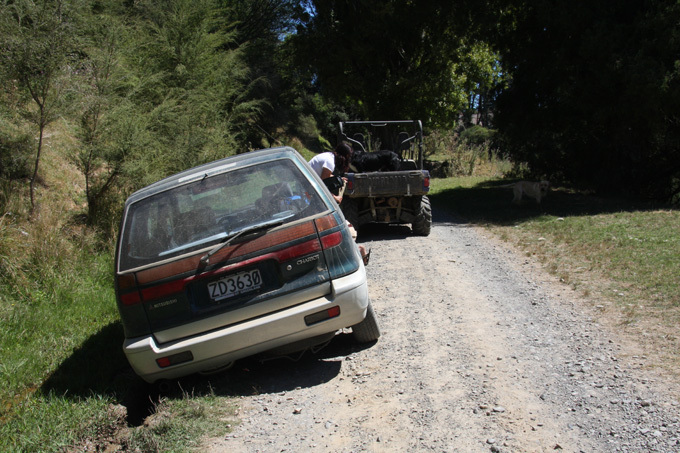 We drove down along the river on a side road to find a lunch spot, and Graham got distracted while letting someone past on the road and dropped one wheel into a soft, grass covered gully … during the drought, it must have been the only mud for miles. It was so deep that the car sunk until it stopped on the chassis …. very embarrassing …. !! 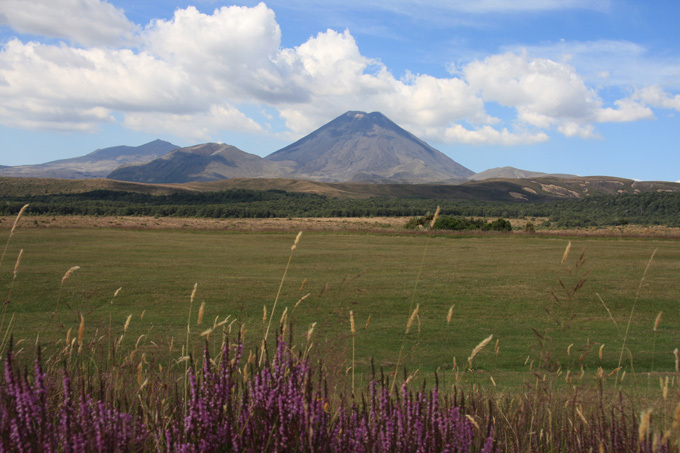 You can see the volcanoes of Tongariro from quite a distance as you drive towards them. 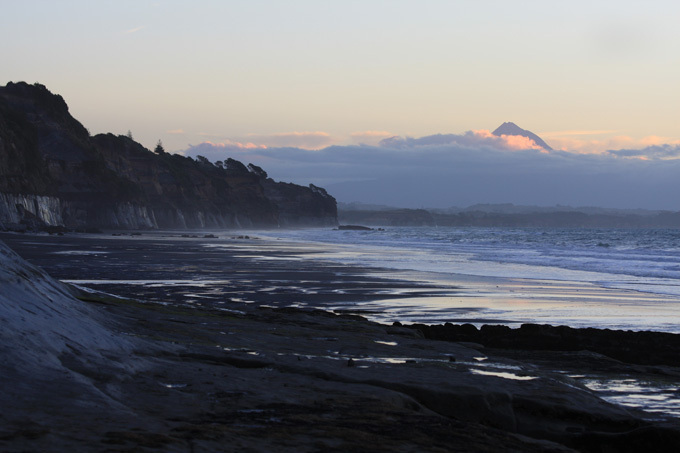 You may recognise the volcano on the right as it featured as Mt Doom in Lord of the Rings. 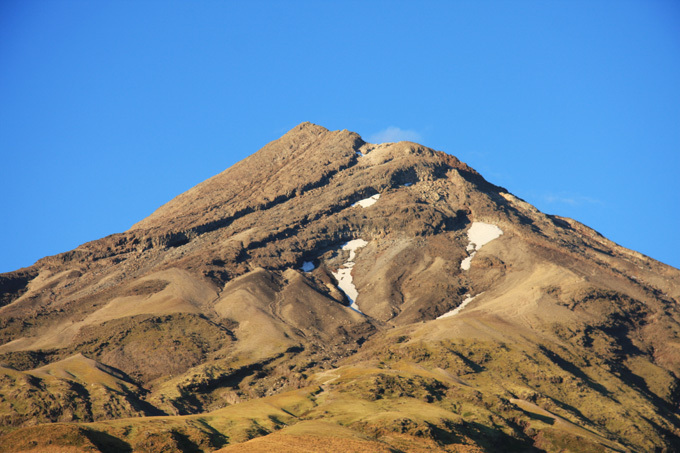 Its real name is Mt Ngauruhoe. 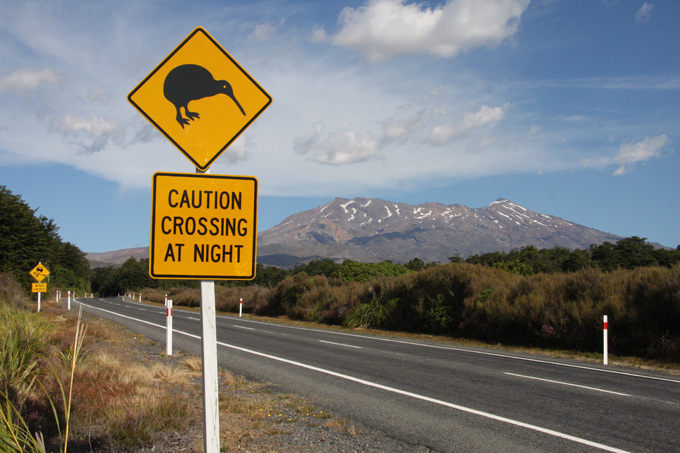 One of the standard post cards of the mountain includes a Kiwi sign just in case there is any doubt which country you are in. 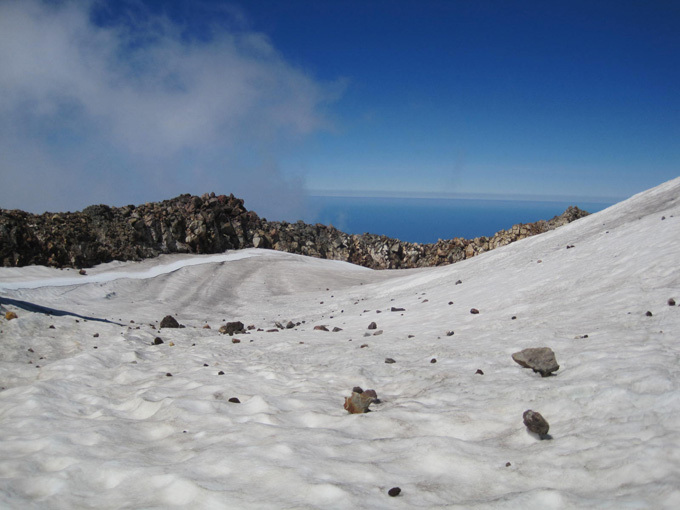 One of the classic walks in the area is the Tongariro crossing, however it is another one or two day walk and we could not face it so soon after Mt Taranaki … lazy!! 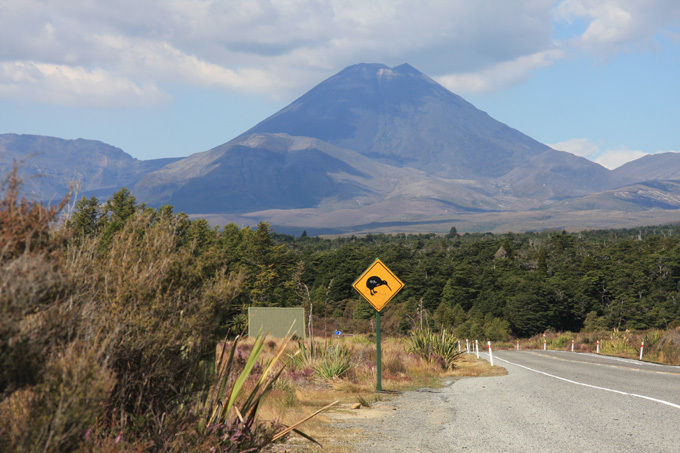 That meant that we had to drive around taking as many volcano views as possible …. 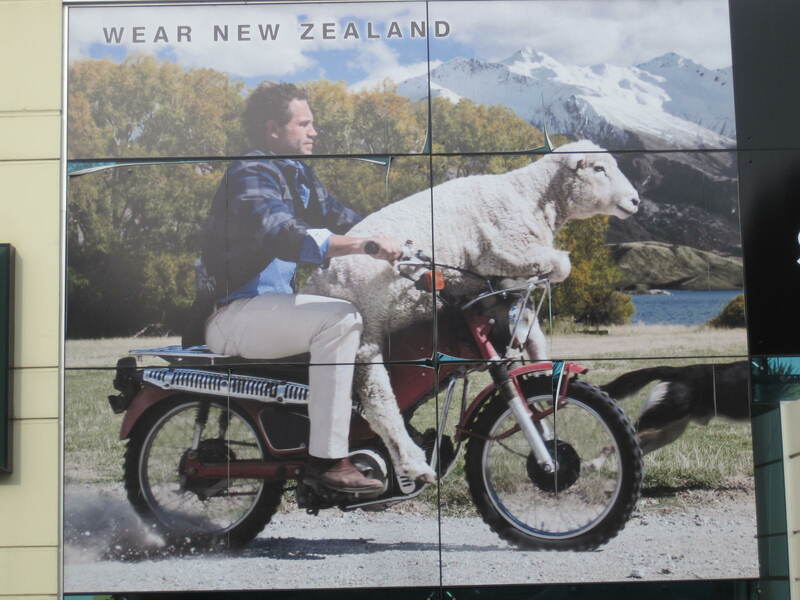 mostly with Kiwi signs … here is another one! 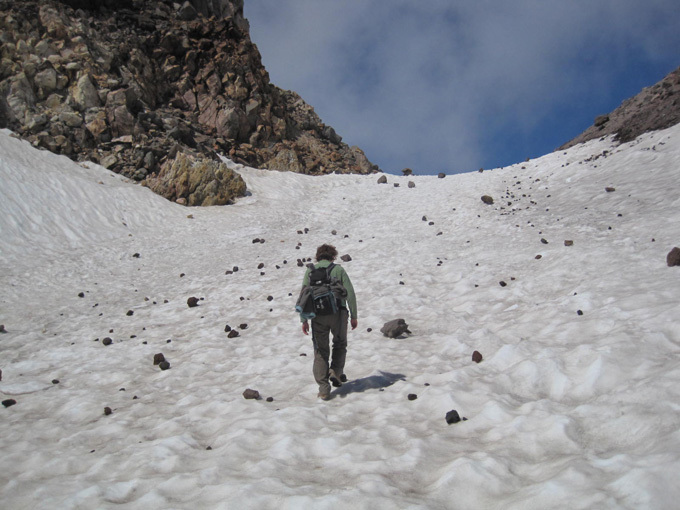 Another reason for not doing the walk was that Marjool had already done it during her very first backpacking trip …. in winter, equipped with only a woolly jumper, trainers and supplies in a carrier bag (water and chocolate) with her friend Shirl. Lucky they survived! 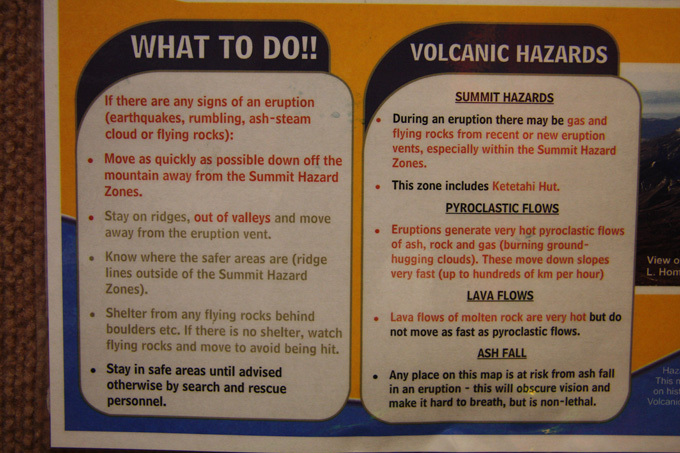 A quick stop in the visitors centre at Tongariro and a look at the ‘what to do in an eruption’ confirmed that it was better not to do the walk. I quote ” Shelter from any flying rocks behind boulders etc. If there is no shelter, watch the flying rocks and move to avoid being hit”. Scary! 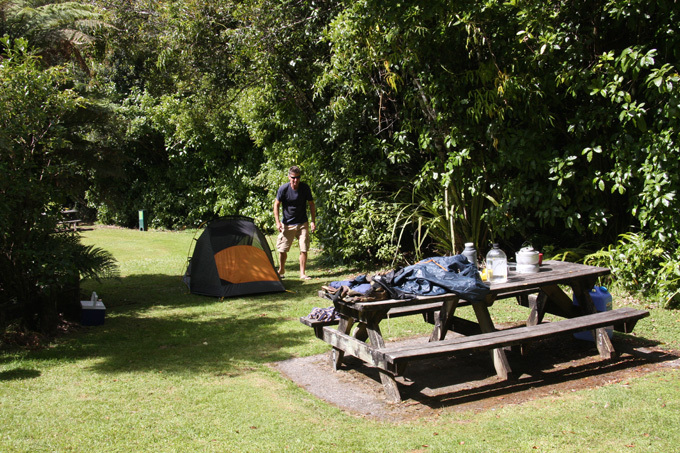 We drove on towards the south side of Taupo lake and found a really nice Scenic Reserve outside Turangi that allowed free camping and pitched up for the night. 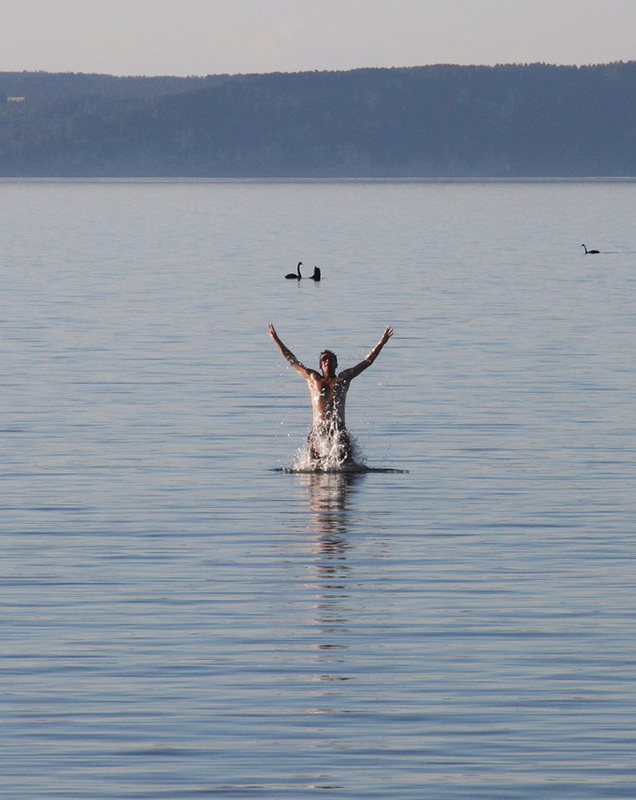 Graham played in the water with the black swans while Marjool cooked the dinner. 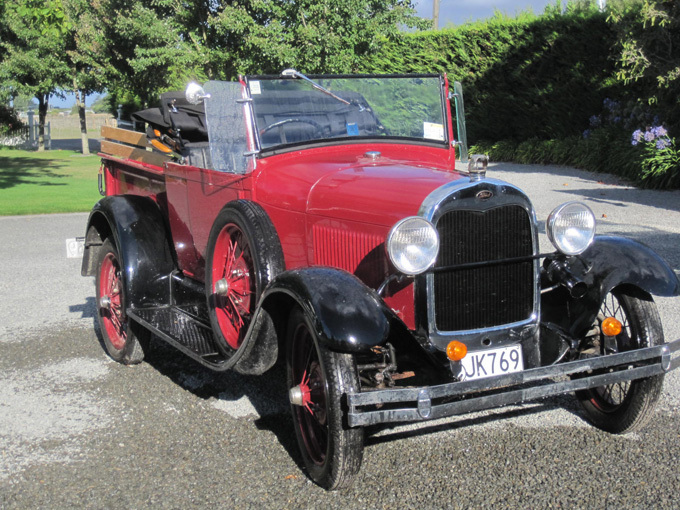 Late tomorrow we are picking up Tom in Taupo as he is coming to pick up the car. 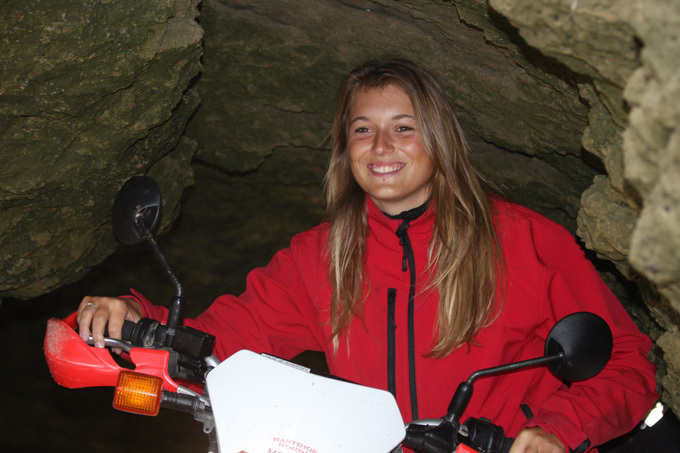 In the morning we gave an Austrian girl a lift who had been camping at the same spot. She was heading for work at Rotorua and Taupo was a good place to pick up a lift for the last leg of the journey. We dropped her off at what we thought would be a good spot to get a lift. We then went and found a cabin on a campsite so that we could unpack the car completely and re pack everything in our backpacks. Graham also went to Repco (the big car spares place) to buy some engine coolant, oil filter and some spare belts for the car. The coolant had been replaced with water at some point and it was starting to show signs of corrosion in the header tank …. boring! 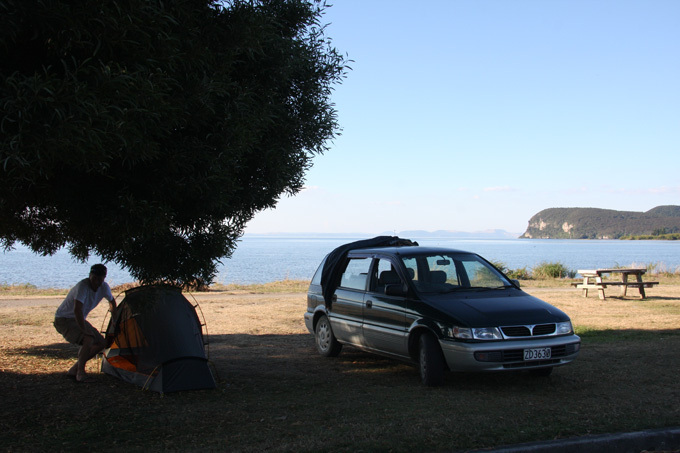 The campsite lent us a hose and we washed the car …… looked as new as a 17 year old car can! Tom arrived from his long bus ride from Kaitaia at 1.00 am. After a slow start we packed everything and checked out of the campsite. 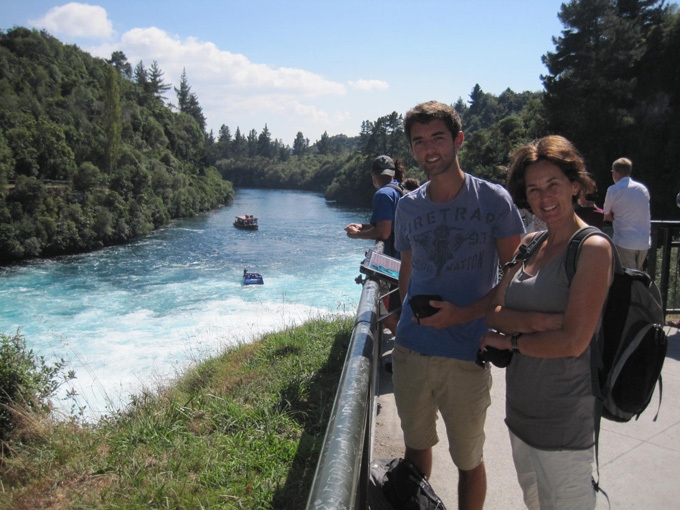 A short drive from there was Huka Falls which we had heard was worth a visit. 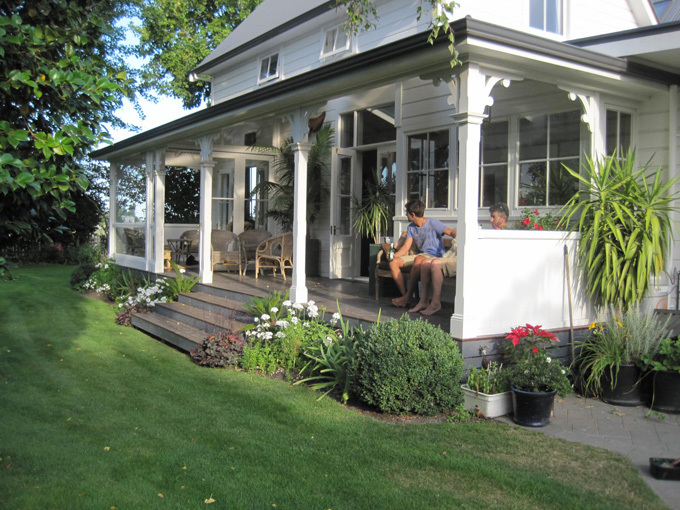 We then drove to Napier on route five to visit some friends in the nearby town of Hastings, Steve and Denise. 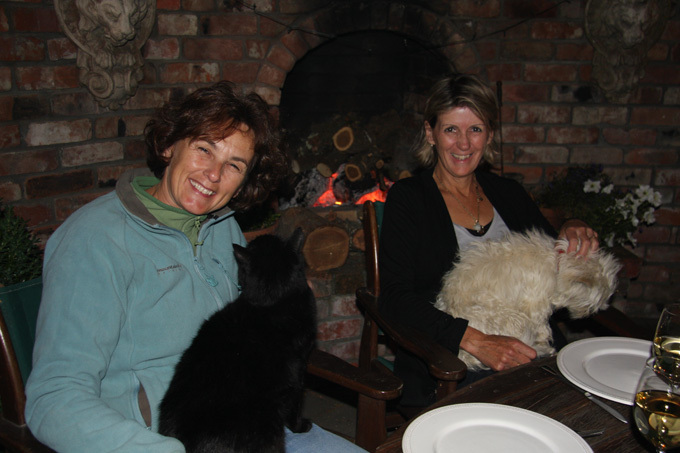 We had met them through the Troopytracks website as they are planning a trip through Mongolia and were interested in our vehicle and the route. We met them in England when they were visiting for the Olympics. Lovely people! 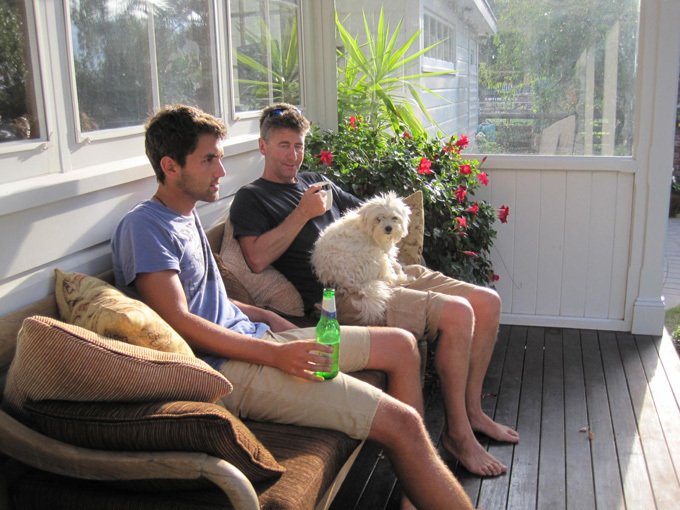 They were busy working when we arrived and so we relaxed in their back porch. 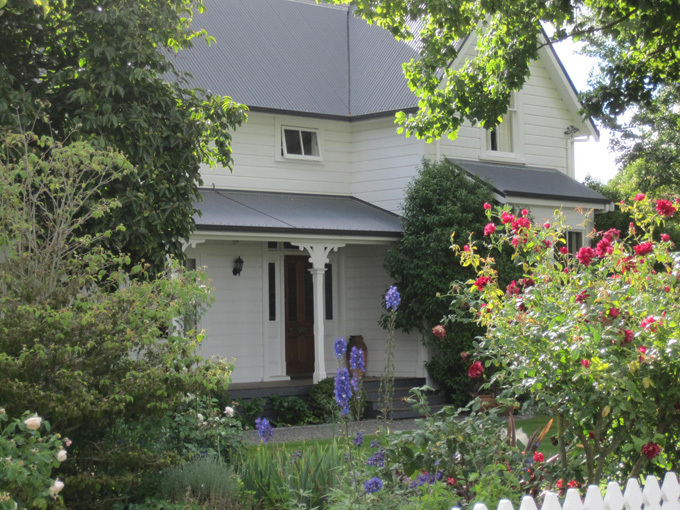 The house is a much renovated old colonial house and is beautiful! 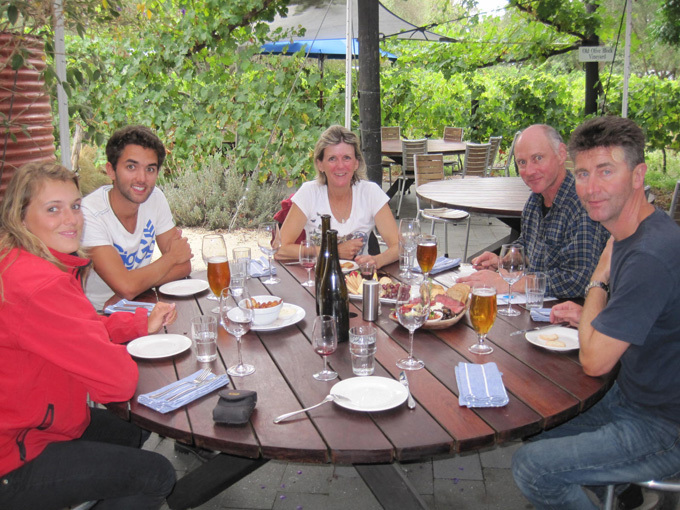 We then took a drive up Mt Mata, a peak near their house with great views over the farmland and wineries. 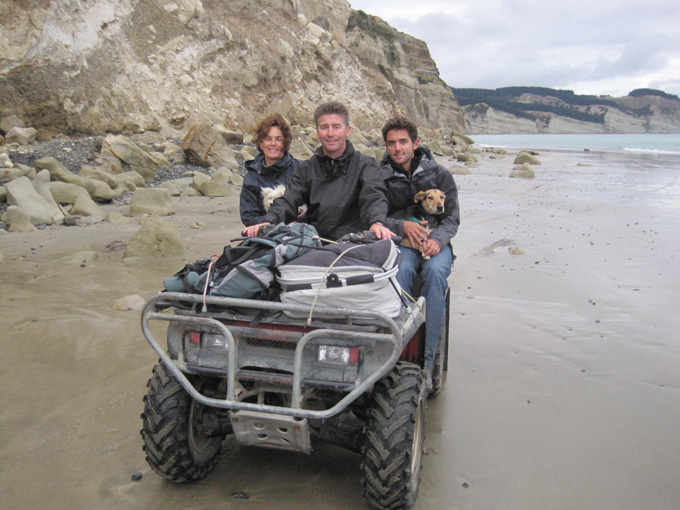 The next morning Steve and Denise were taking us on a drive along the beach on motorbikes and a quad to see the gannet colonies at Cape Kidnappers. 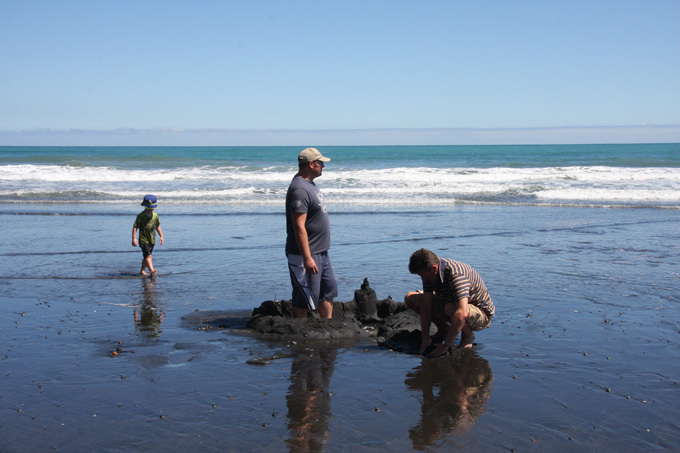 Timing was important as you can only get there at low tide. 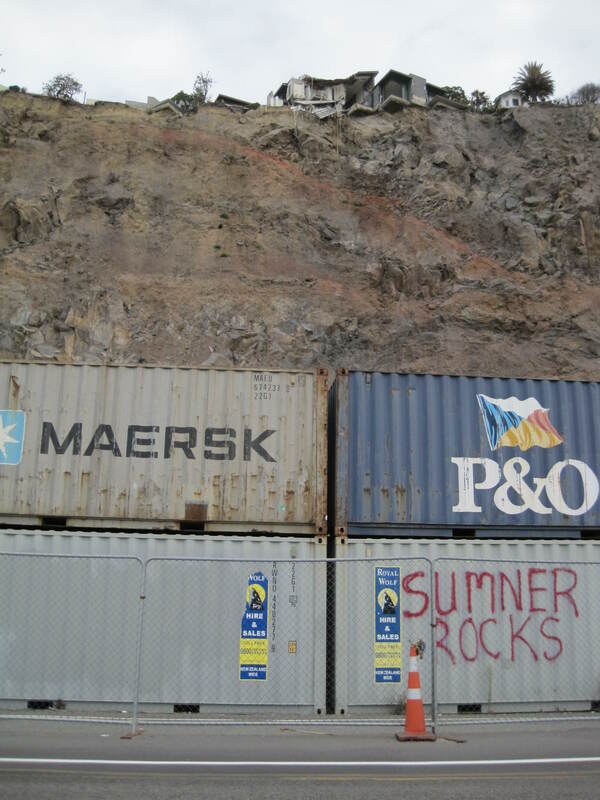 You need to be back before it rises or you are cut off by the cliffs. Only downside was that we had to set the alarm at 5.30am to be all prepared and loaded up for 6.45am to catch the tide. It would be worth it though! Got up in the pitch dark this morning and quickly packed up the car so that we could get an early start. We had a quick breakfast in the car park and loaded the small rucksacks with 5 litres of water and some sandwiches. There is a sign at the bottom showing the different walks. We were hoping to do the summit walk. The mountain looked good in the morning light, but the top looked a long way off. 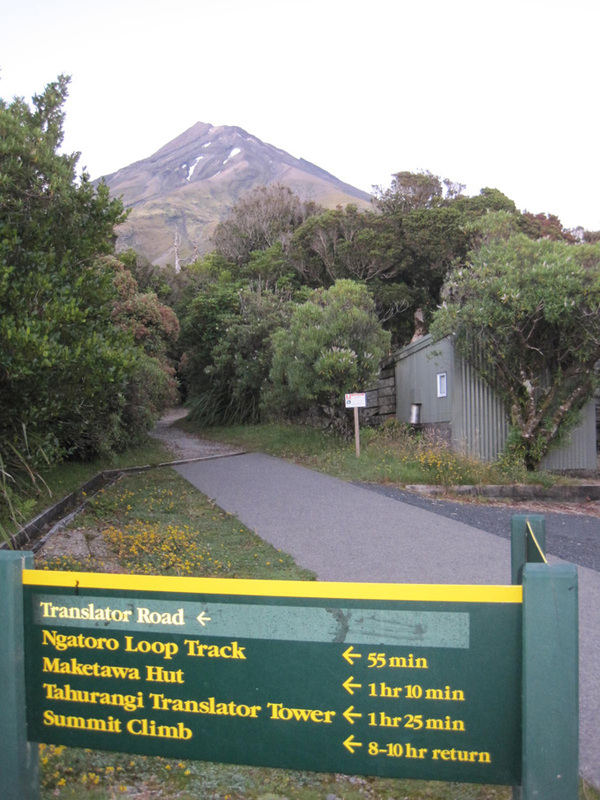 The first part of the walk runs along a 4×4 track which winds around the mountain. It then turns into a steep concrete track that runs up to a communications mast. It is used to get maintenance vehicles up. This is all steep but relatively easy. It takes around 1 hr 45 mins to get here. The path runs past a hut to a very rocky area which is a bit of a scramble. At the top of this section, steps had been built out of timber. The steps went on and on but were easy climbing. 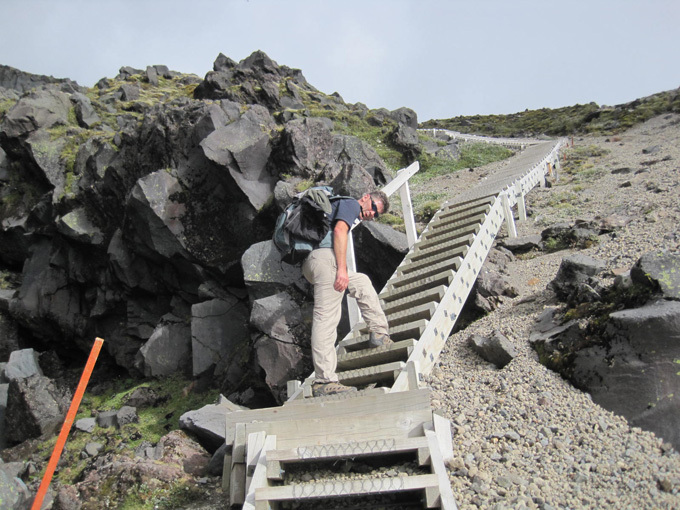 At the top of these steps was a long long scree slope, one step forward and slide half a step back. 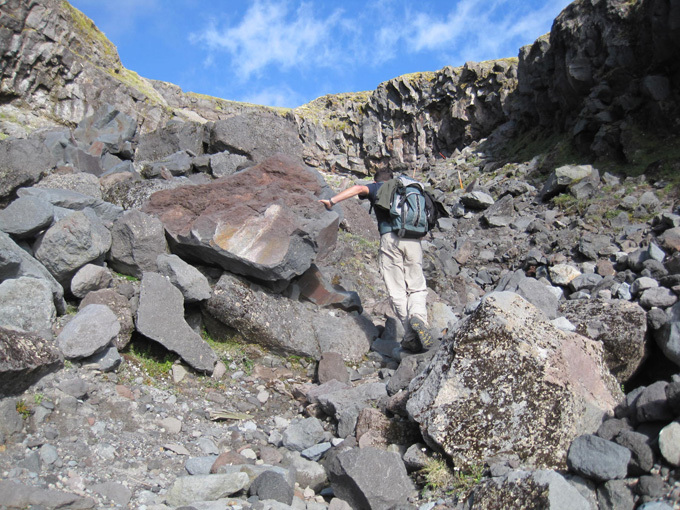 The scree was small round stones and rolled under your feet. We did not take pictures on this bit as getting up was a bit of a struggle. 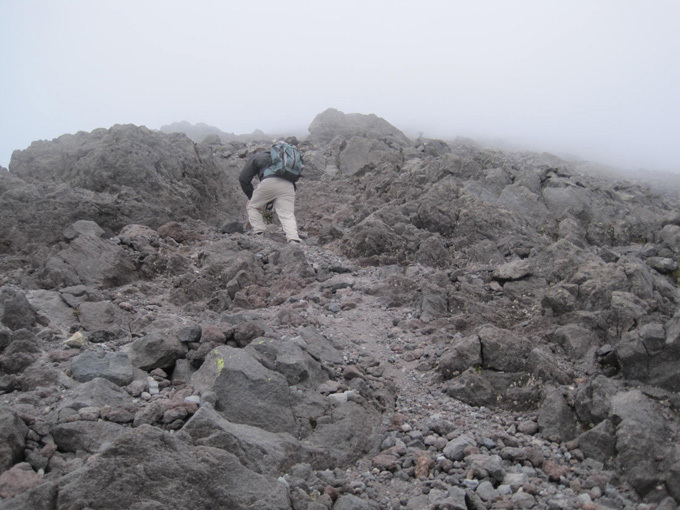 At the top of the scree we moved onto a rocky stretch that was part walk part climb. We stopped here for lunch. After lunch we continued up the rocky section. The cloud had come in and so it was quite cool …. not great for the views though. Eventually after much puffing, blowing and stopping we walked into the crater! As you walked on towards the edge of the rim, you could see the sea. The crater was as far as we went. 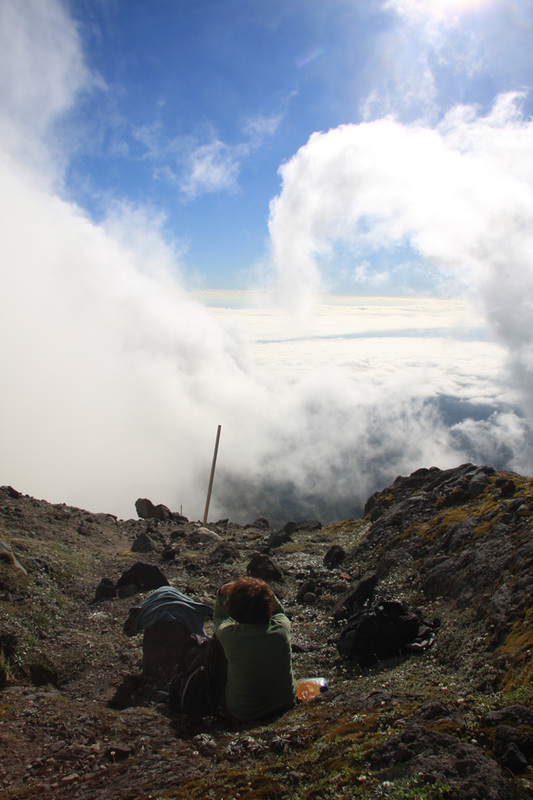 You can go up on to the edge of the rim which is the true summit, but it is only about 50m higher and our guide book said respect the locals wishes and do not go to the top ….. we were happy with this as we were worn out!! The way down was also really tiring as it was hard to stay upright on the scree. 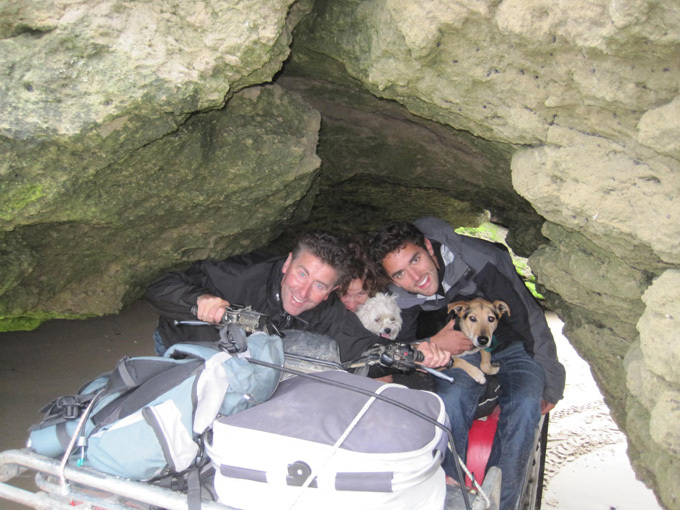 By the time we got back we were pretty well exhausted …. Not an easy way to spend almost 9 hrs …. but satisfying. We were feeling pretty pleased with ourselves, but talked to a 72 year old man on the mountain who had climbed it 9 days in a row! His record was 18 days on the trot and only stopped then due to a change in the weather. We have not checked yet, but were told in the visitor centre that someone had once gone up and down the mountain in 1hr 48 mins ….. surely not!! We should sleep well tonight. The beds were far too comfortable to leave when Lew got up at 6.00 am to fish …. we finally got up at 8.00am both mornings! Then enjoyed a slow breakfast looking at the view. 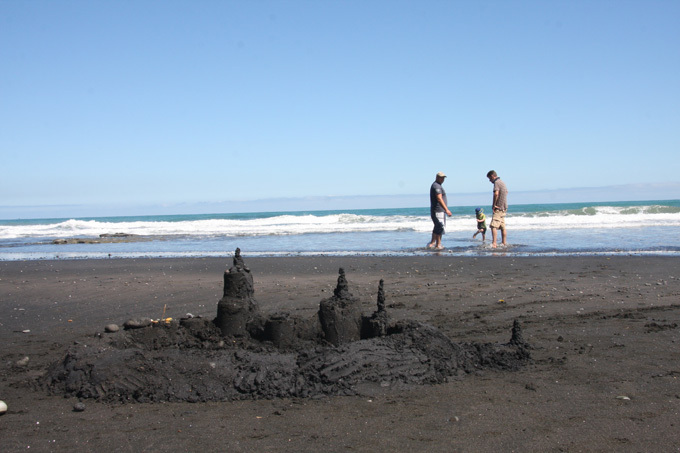 The beaches on the west coast all seem to be black sand beaches, strange for us and they get really hot in the sun. 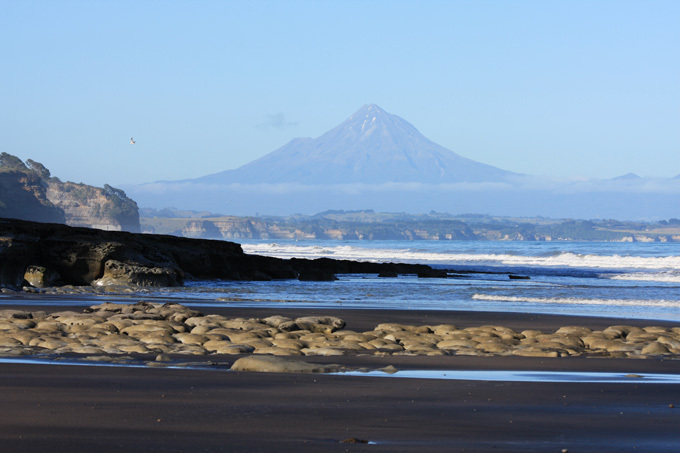 At low tide you can look along the cliffs towards New Plymouth and Mt Taranaki. The mountain looks different all the time, the cloud comes and goes rapidly, changing the view. 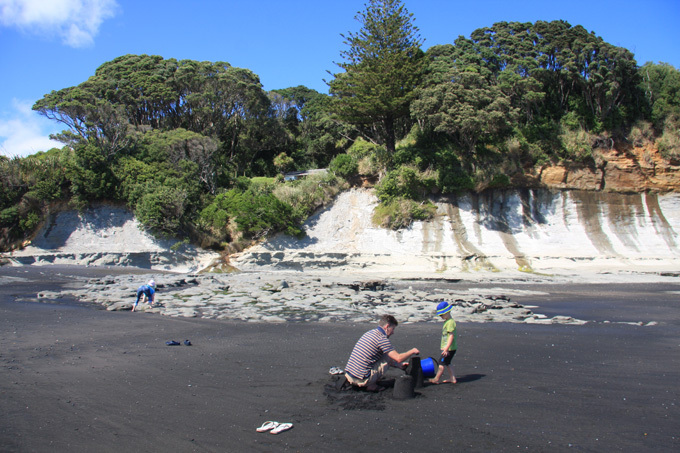 A bit more playing on the beach and it was time to start packing up … over all too soon. Thanks Adrienne Lew Ollie and Bella for a great weekend! 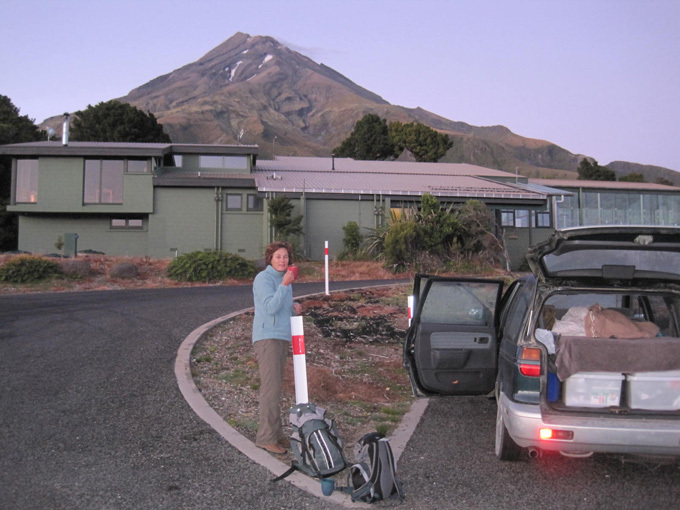 That night we camped in a DOC picnic area just below the Mt Taranaki visitor centre. 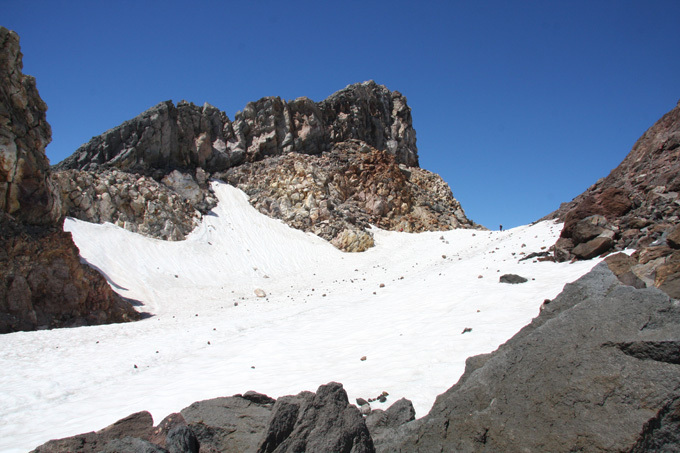 We had decided to climb it the next day …. though it does look steep! Alarm set for 5.30 am! 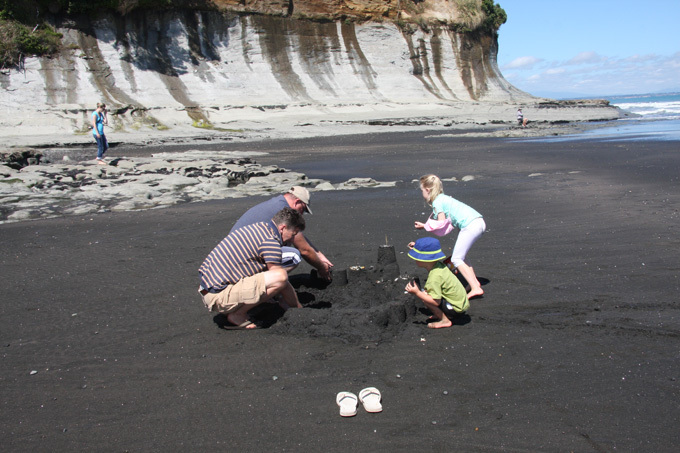 The drive from Matamata to Taupo took us most of the day with several stops. 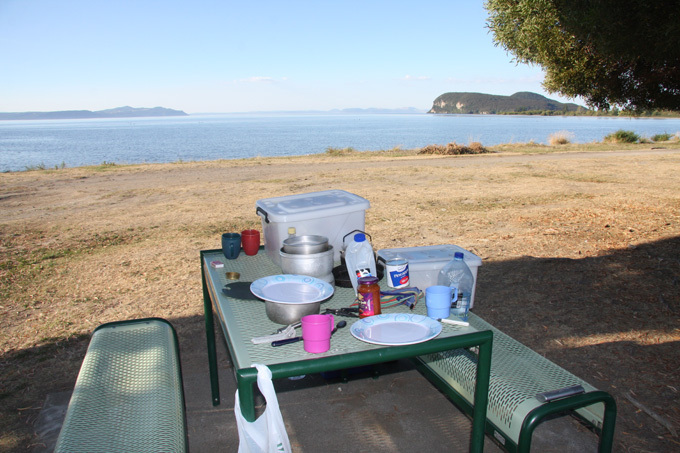 Lunch usually involves setting up our dining spot with plastic storage boxes and chairs, and then boiling the kettle on the Trangia stove. Like a couple of old people parked by the side of the road at home! 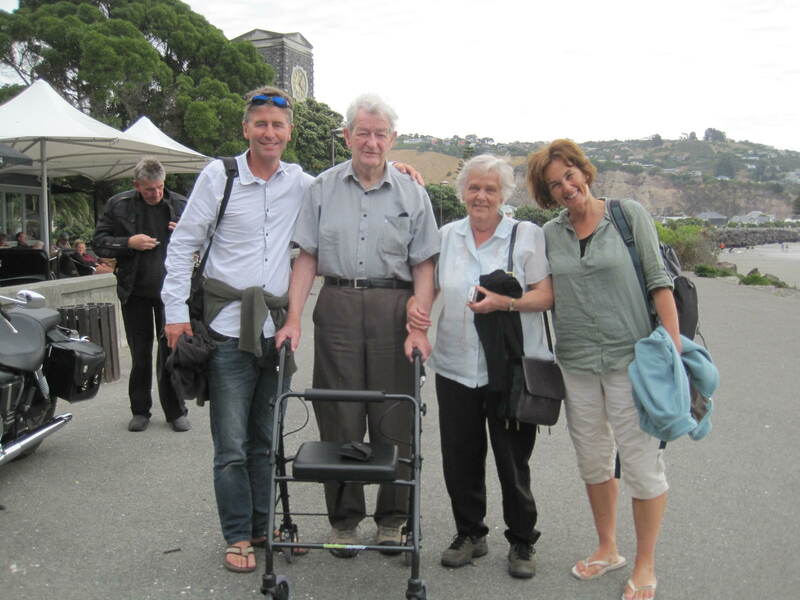 As we arrived at Taupo we stopped at the top of hill above the town. 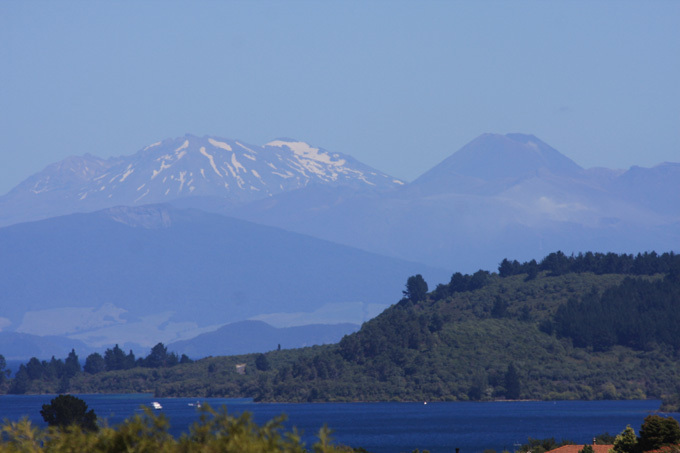 Here you can see the lake and the three active volcanoes at Tongariro national park in the background. 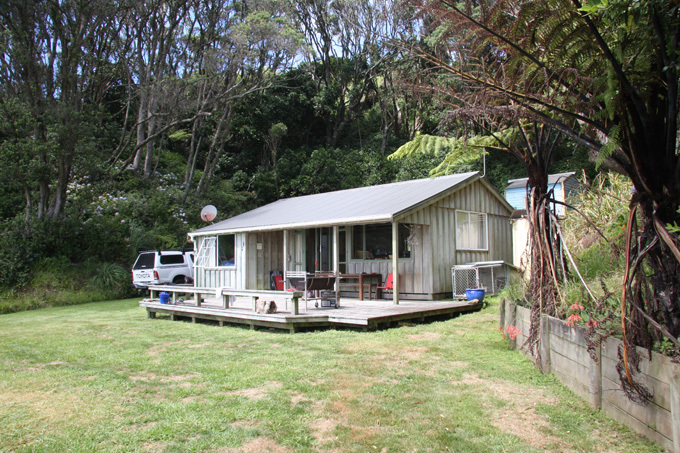 We had heard of a nice free camping area on the river just outside Taupo called Reids Farm. We set up there for the night with the tent less than 2 meters from the river. Although a busy spot Graham thought that it was worth trying to catch dinner. He got a bite almost straight away, but not quite big enough to feed two hungry campers! Despite his best efforts we had to cook a pasta dish instead! 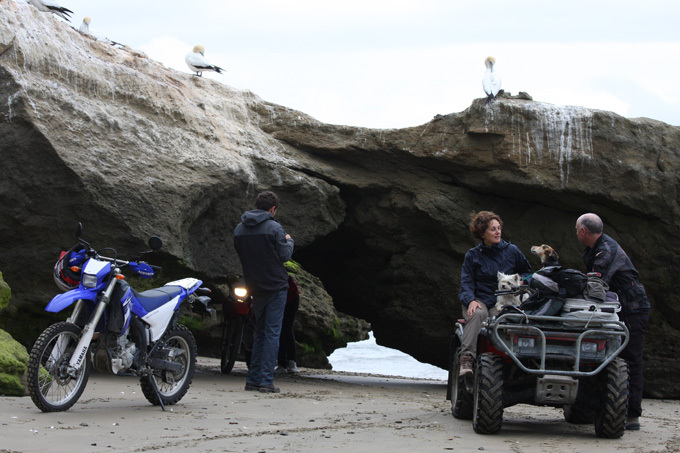 Tomorrow we are heading to the west coast to meet the family who had planned to drive through China with us in 2011. Them in Landy and us in Troopy! Route 1 to Turangi, 41 to Taumarunui and then from Mangaparo we took the 40 to Ahititi. Part of this was unsealed but in good condition. 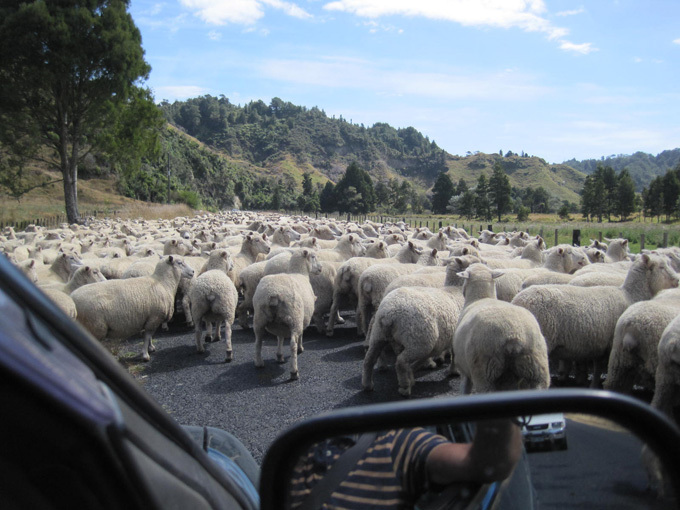 Along the way we met a farmer moving part of his 3500 Romsey flock. 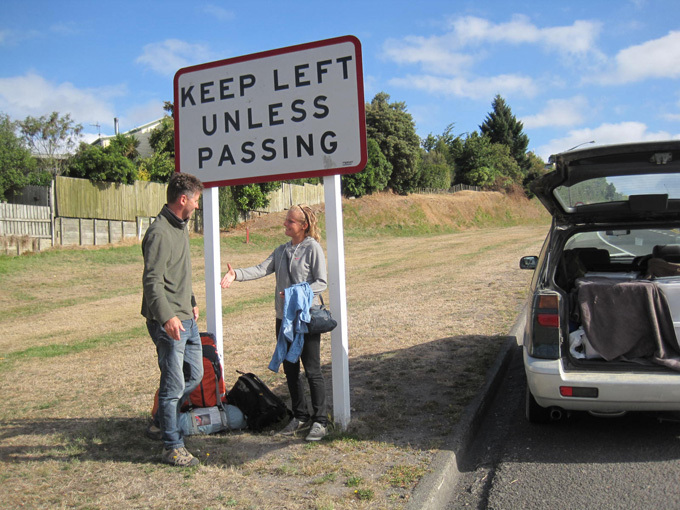 Once at Ahititi we joined the route 3 and the found our way to Waiiti Beach where we were meeting our friends. It was a lovely spot and they had invited us to stay in the bach (cabin) in real beds! A great treat after a couple of weeks in a small tent with carry mats. In the picture below you can just see the bach in the trees, near centre. 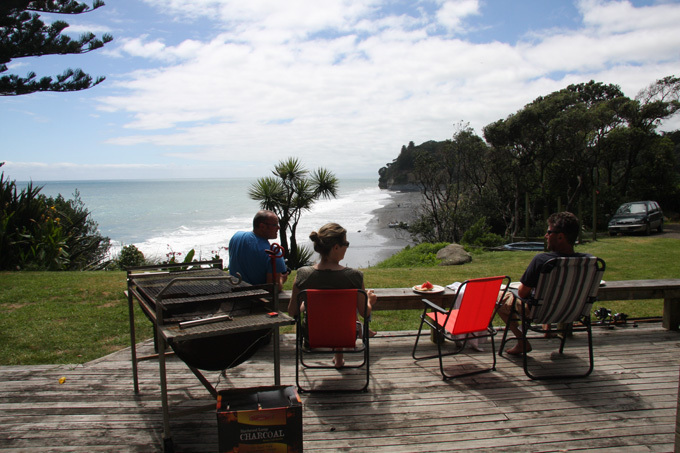 Lew set up the BBQ as soon as we arrived and treated us to meat of every description, washed down with beer and wine …. thank you both for your hospitality!! Tomorrow we are planning to do very little.